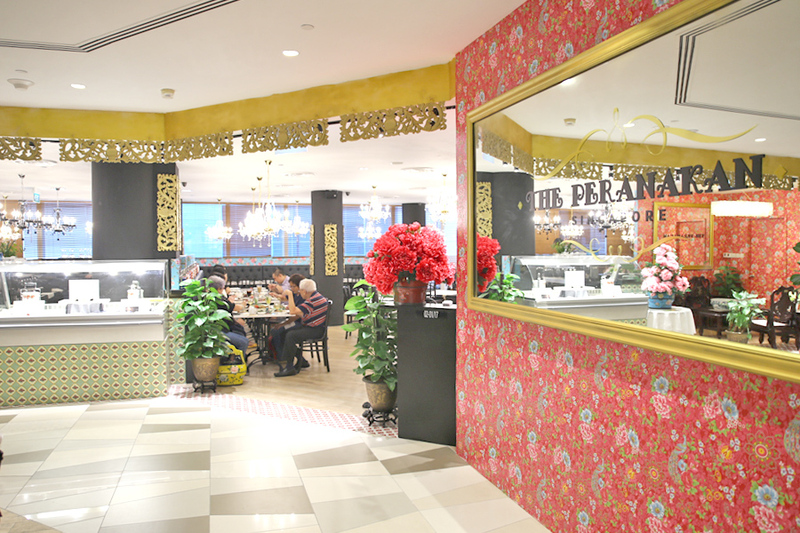 Founded by Executive Chef Raymond Khoo in May 2016, The Peranakan Restaurant serves authentic, pain-stakingly handmade Peranakan dishes, made using his family’s recipes, in an opulent setting. 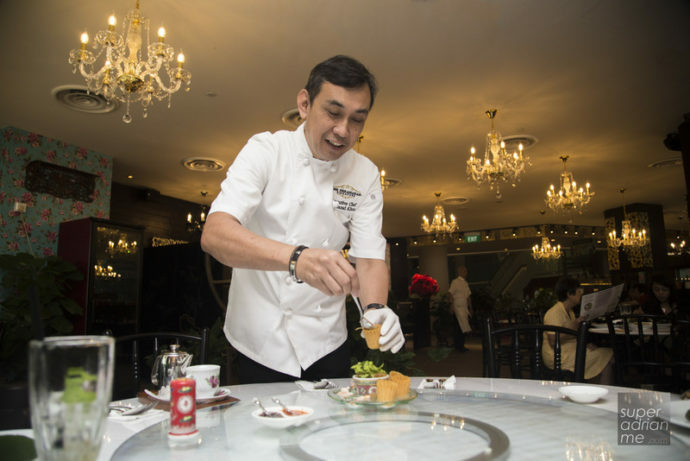 Having helmed several acclaimed restaurants over his 30 year career, Executive Chef Raymond Khoo was egged on by his family to come out of retirement, to start a Straits Chinese cuisine restaurant with the traditions handed down through 3 generations of Nonyas and Babas. 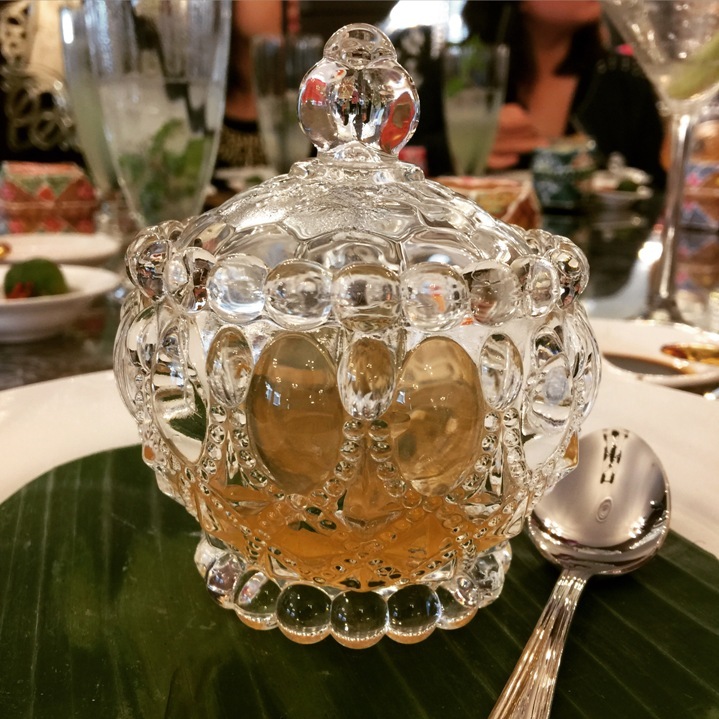 Ambience at The Peranakan Restaurant is opulent, exuding an elegant sophistication. 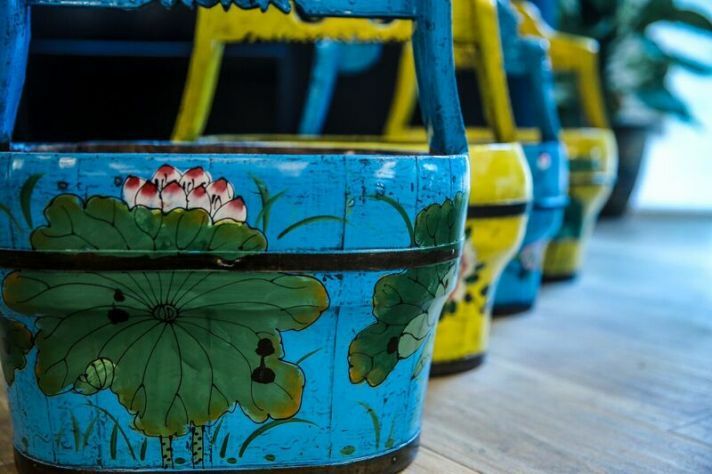 The brightly lit, spacious seating area is lovingly adorned with touches of Peranakan, Baba-Nyonya decor, including floral print wallpaper, vases, pots, tiffin carriers, and sturdy marble topped tables and black wooden chairs. 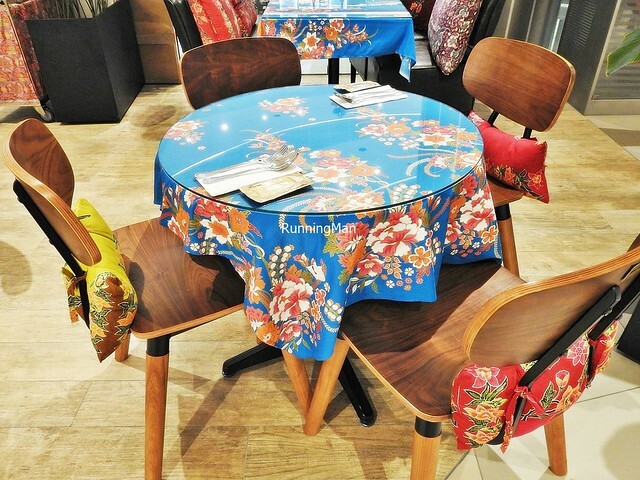 So many chandeliers hang overhead, while batik print cushions line the comfortable booths. 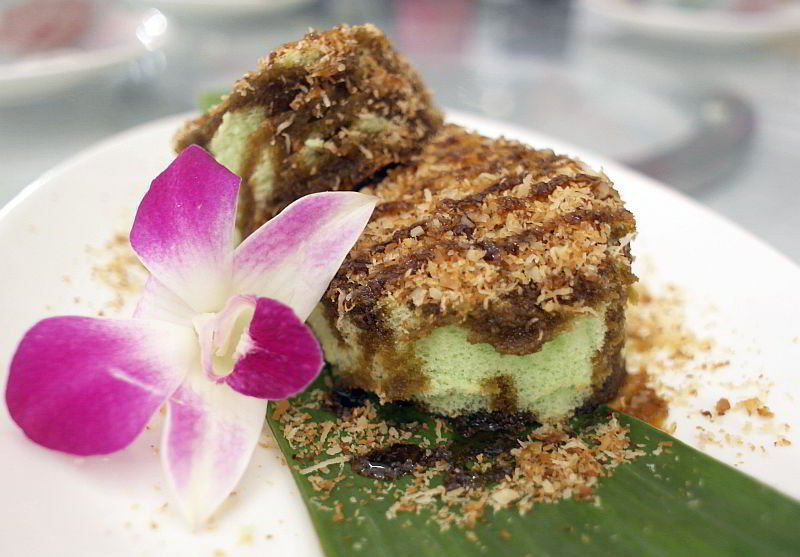 Simply jaw-dropping and stunning in looks, a precursor to the bold flavours of the dishes! 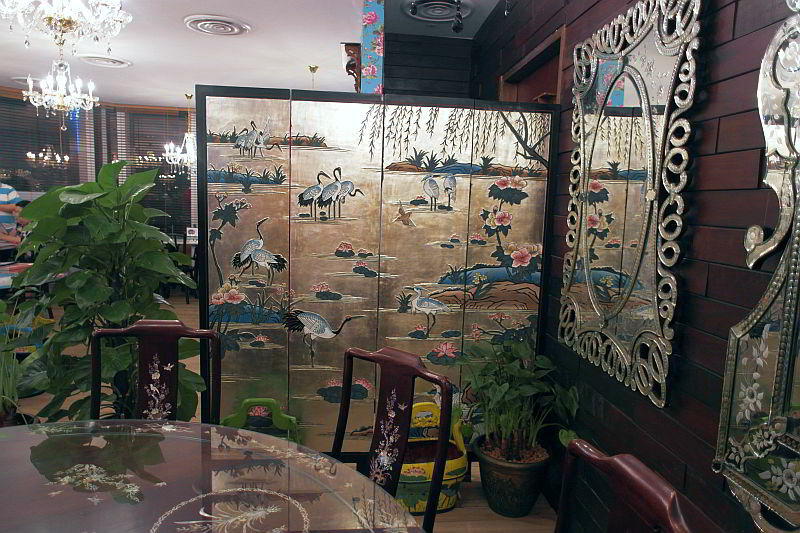 Service at The Peranakan Restaurant is friendly, professional, and courteous. 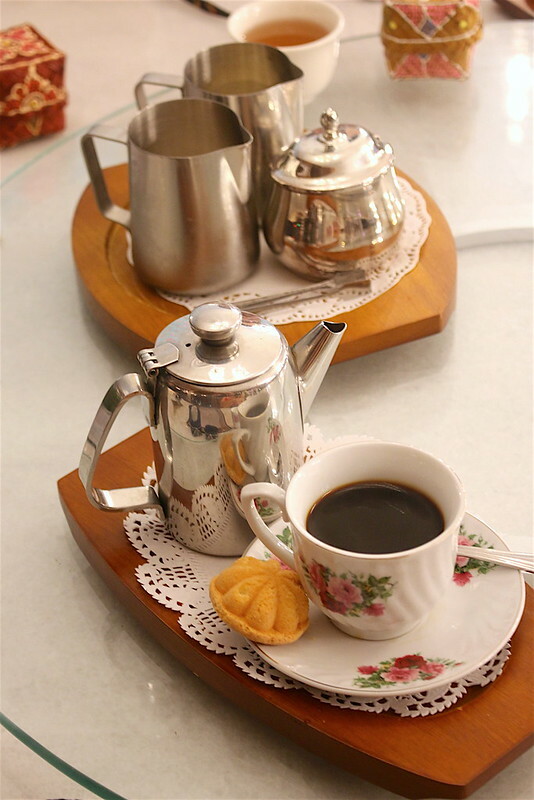 Staff are quick to greet and seat guests, and will move around to observe if guests need assistance. 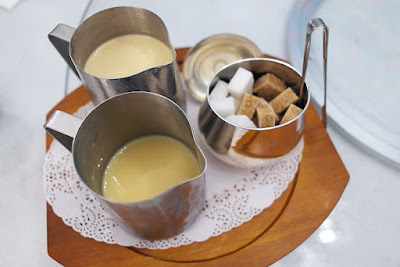 I note they’re familiar with the menu and dishes, able to share brief descriptions, but nothing beats having Chef host you, and share the history of his family recipes. 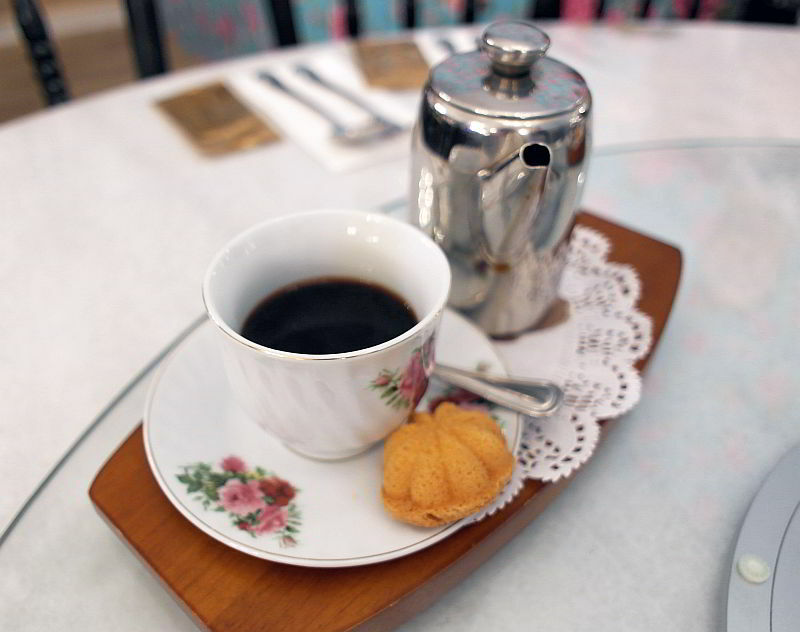 Staff attend to requests quickly, and are efficient are clearing away empty / dirty plates or tables. 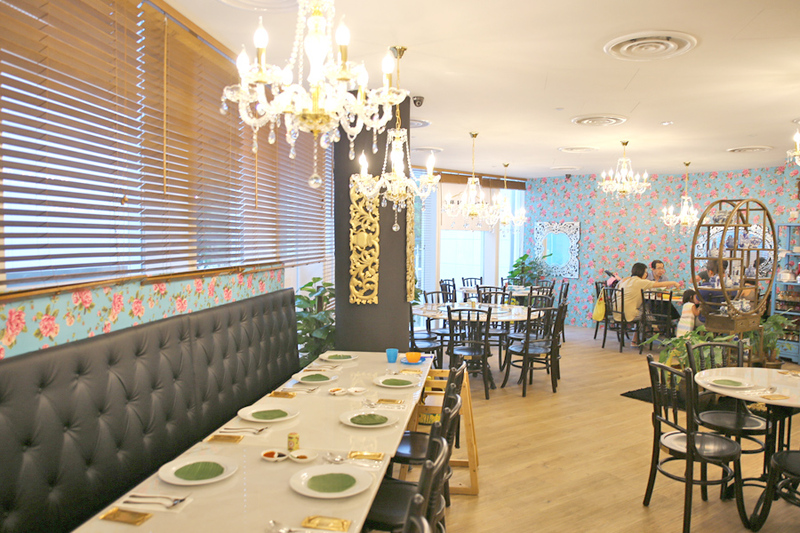 An above average restaurant style service, befitting of the hospitality of the Peranakans. 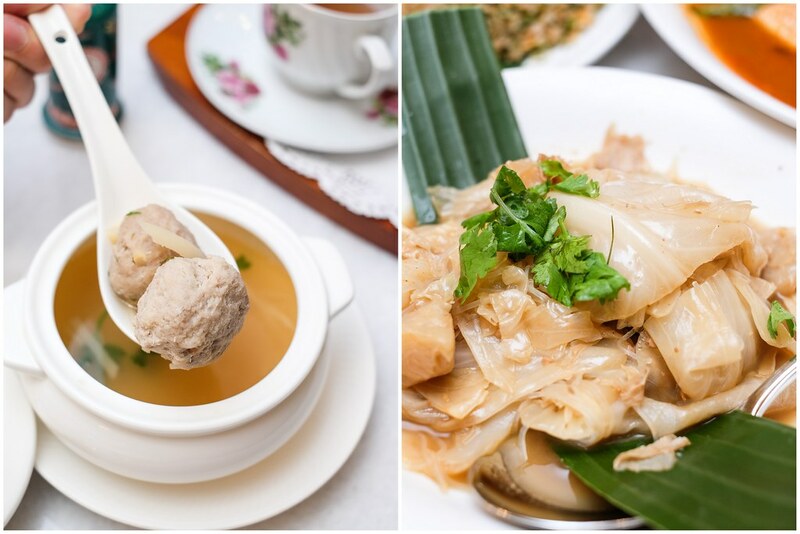 Food at The Peranakan Restaurant is distinctly Straits Chinese cuisine, done according to traditional Peranakan / Baba-Nyonya recipes of Chef’s family. Everything is pain-stakingly handmade here, and the time consuming effort to produce each dish is astounding, a testament to its traditional roots. 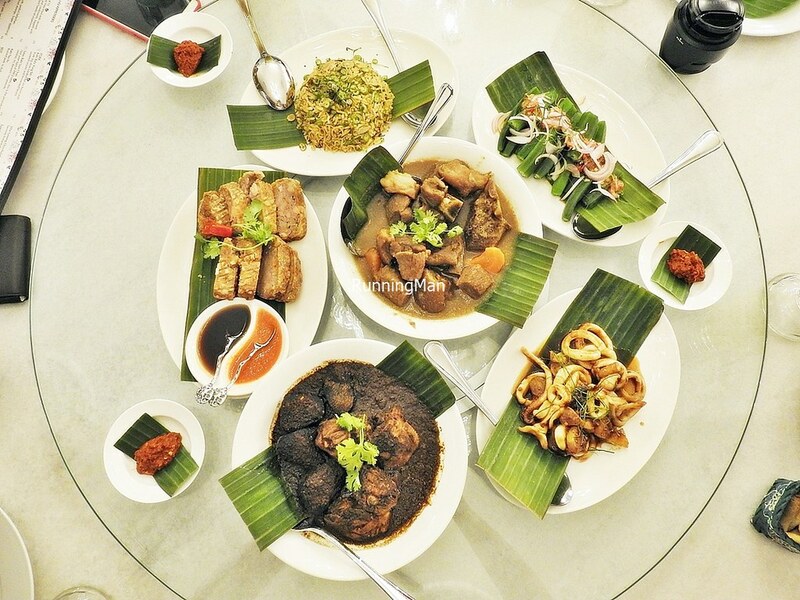 Each heritage dish we tried was delicious, bold in flavour and really tasty. 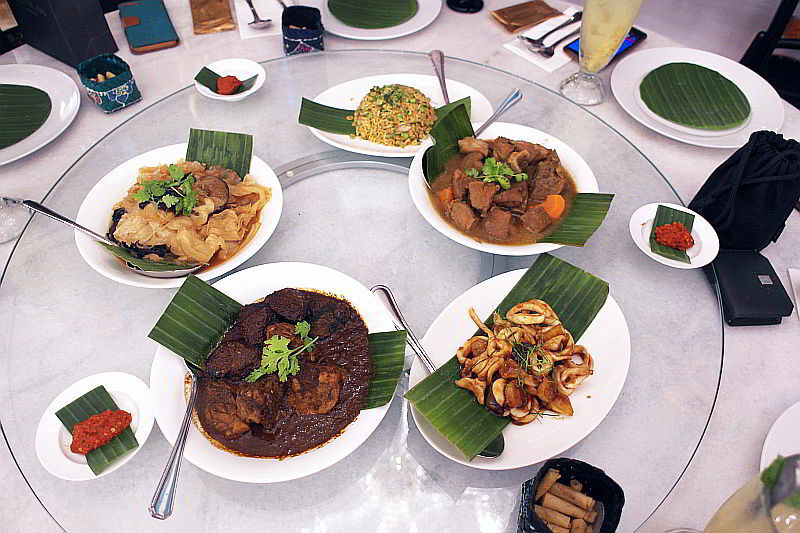 Portions are designed for communal dining of at least 3 – 4 people, remaining true to the kampong spirit of old. 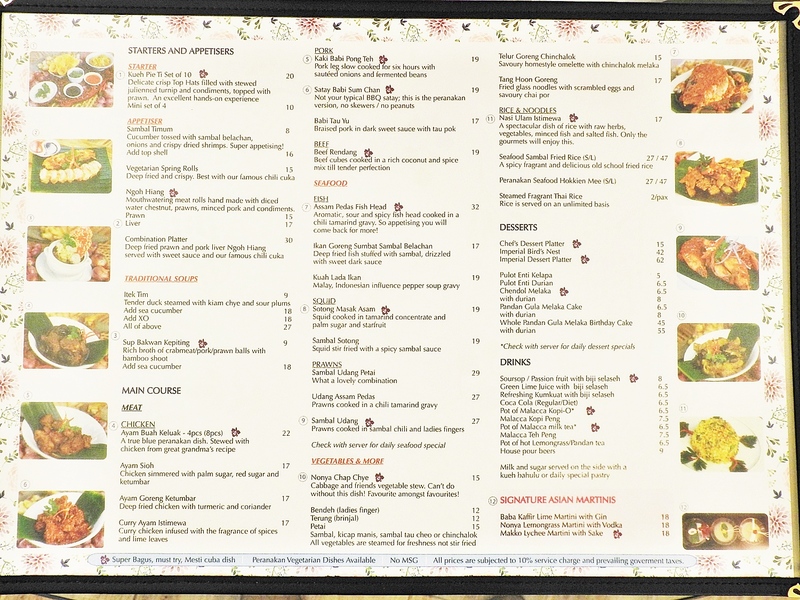 Prices are very affordable for the portion, quality of food, and effort to produce each dish. 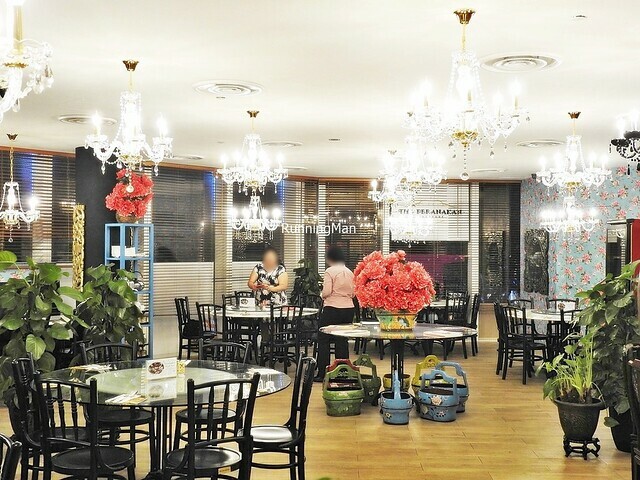 Budget about SGD $28 per person for a full meal here. A sign of good Peranakan cuisine is the home made Sambal Belacan. 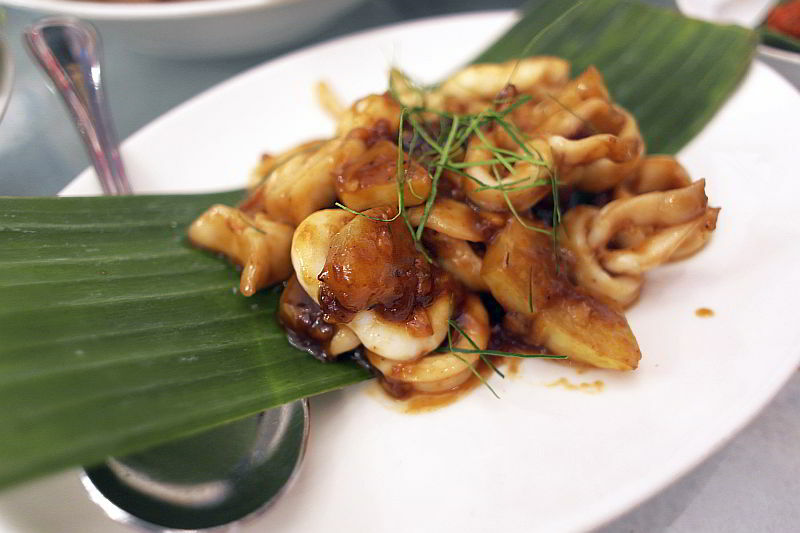 I’m glad to say the version here scores well, having a robust savoury shrimp flavour with a sharp fiery spicy kick. Shiok! We were really excited when we knew that The Peranakan. 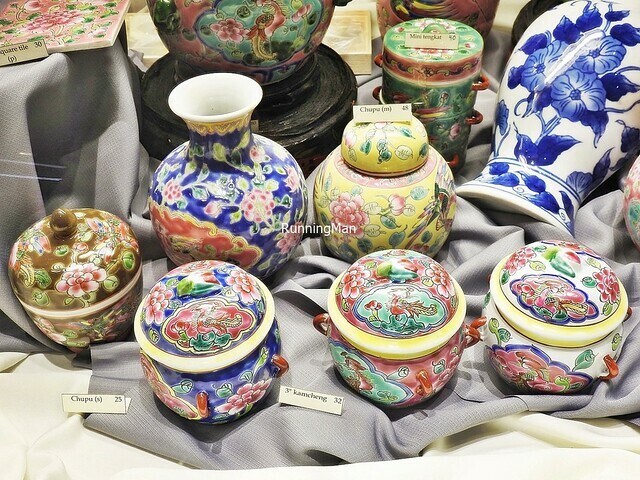 For one, I am always very intrigued by the Peranakan culture and food. 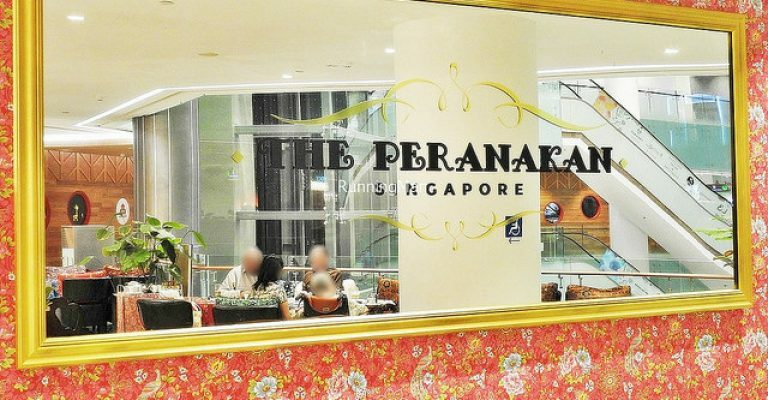 Plus, this is the only Peranakan restaurant that is located along Orchard Road, which makes it easier for us to dine there. 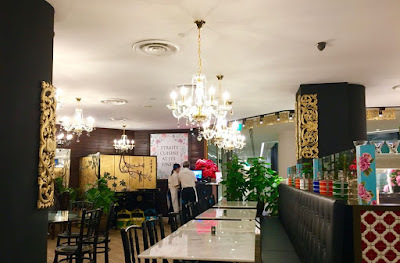 Opened in late May at Claymore Connect, Peranakan Chef-owner Raymond Khoo had these recipes in the family which was handed down by the Nonyas and Babas in his family. 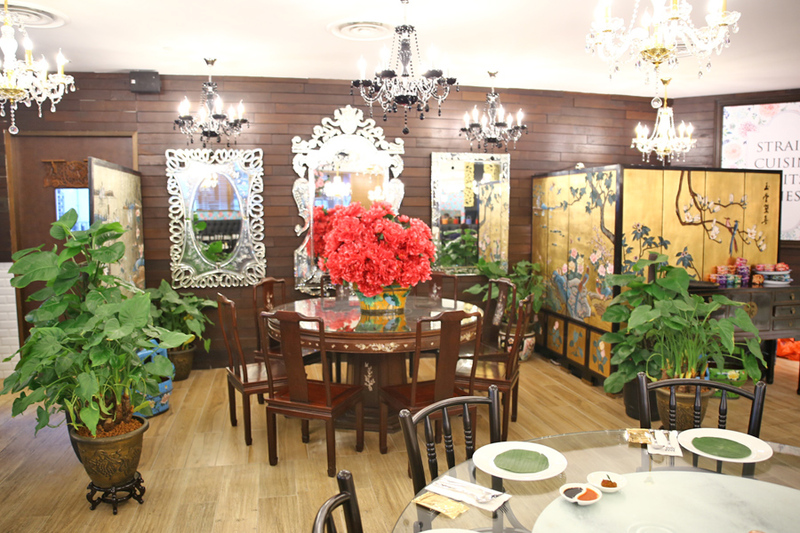 It’s easy to spot the restaurant from a distance – Peranakan style ceramics, floral wallpaper and huge chandeliers… the decor is so elaborate! Plus, the service team has a mix of senior waiters and waitresses in white shirts, making it super nostalgic. We were served by an elderly waiter who had a good knowledge of Peranakan cuisine and recommended us the following dishes. 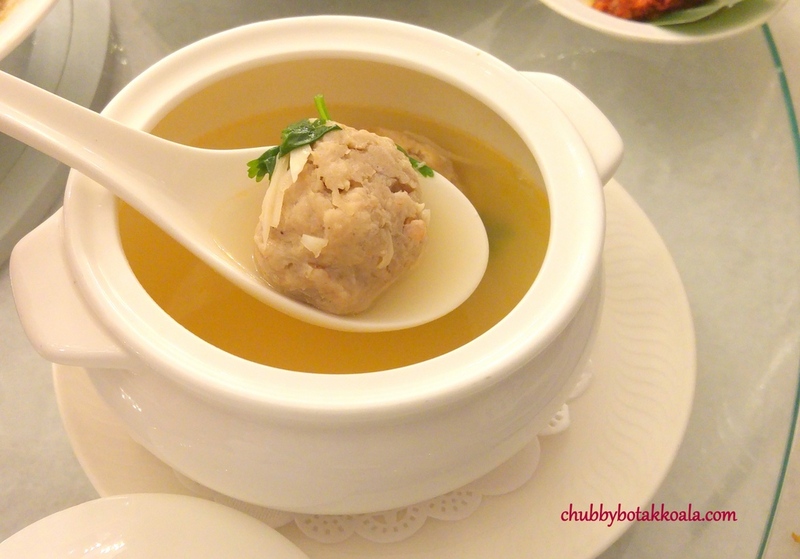 The Sup Bakwan Kepiting ($9) was served with two juicy pork balls, prawn balls and crab meat. The soup was sweet and served with strips of bamboo shoots. Another option is Itek Tim ($7) which was painstakingly boiled for over 6 hours with kiam chye and sour plums and tasted heavenly. On our day of visit, they also have a special appetizer Sambal Jantung Pisang – a banana heart salad which is creamy and spicy. I haven’t had Nasi Ulam ($15) in a while. 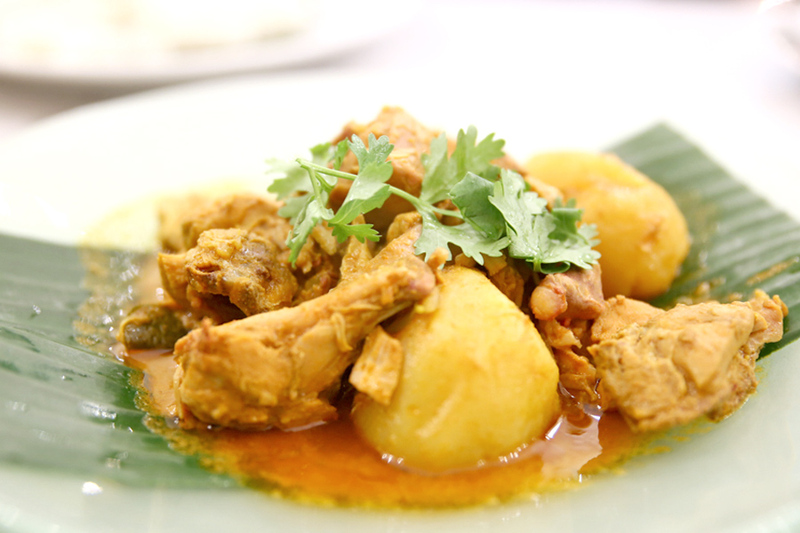 Cooking this dish is not difficult, but the preparation takes a lot of time. 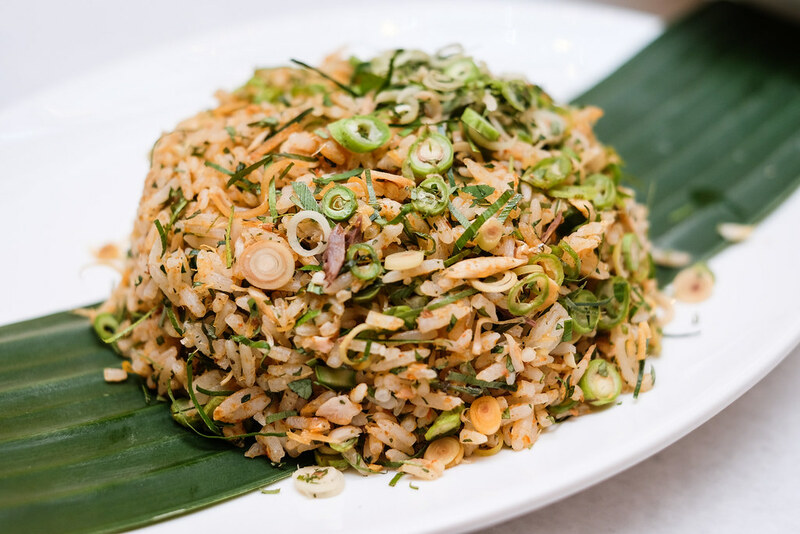 A mix of herbs and vegetables are mixed with rice. 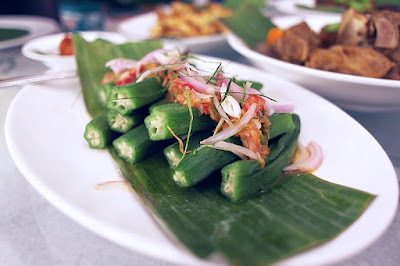 There’s lemongrass, onions, lime leaves etc, together with long beans, toasted coconut and salted fish. It’s very unique to see salted fish in the dish but it surely makes it take better. 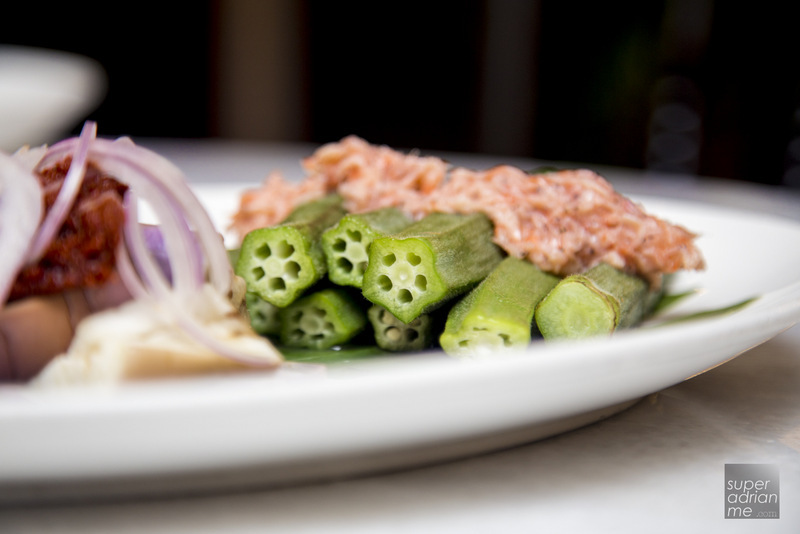 The ingredients are sliced and chopped finely with well balanced herbs. It’s fragrant, healthy and appetizing. 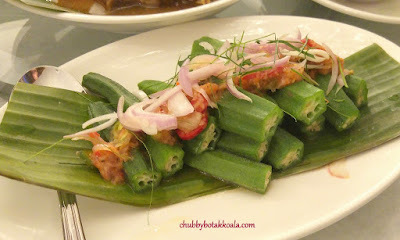 I love to have it with sambal belachan, shiok ah! 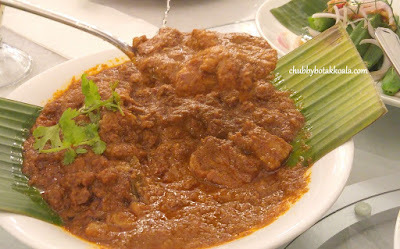 Instead of going for the babi pongteh, we tried the Satay Babi Sam Chan ($19). 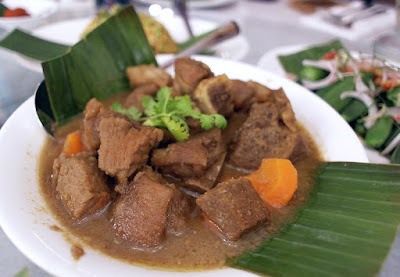 The fatty pork belly is cooked in a special satay sauce that is savoury and fragrant. 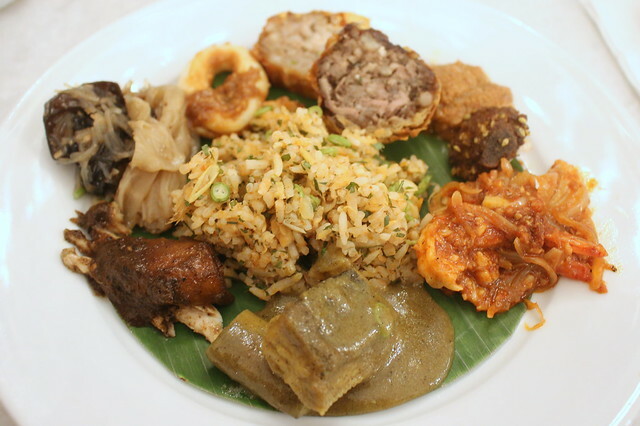 Yup, so instead of having satay stick, you can have this with a plate of white rice and Nonya Chap Chye ($15). 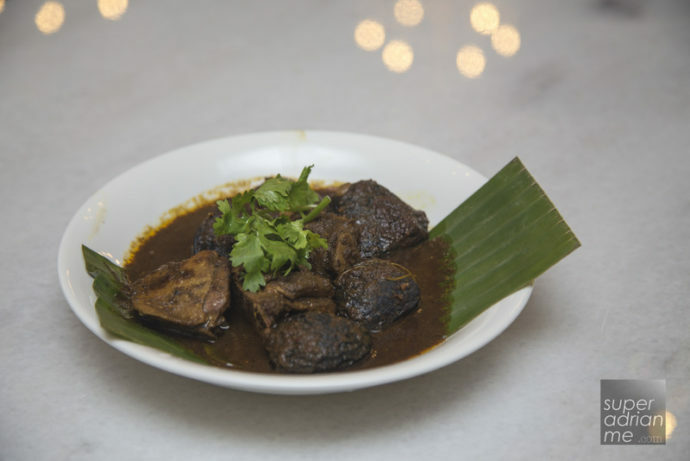 Assam Pedas Fish Head ($27) is addictively good. It’s aromatic, sour and spicy fish head cooked in chilli tamarind gravy. 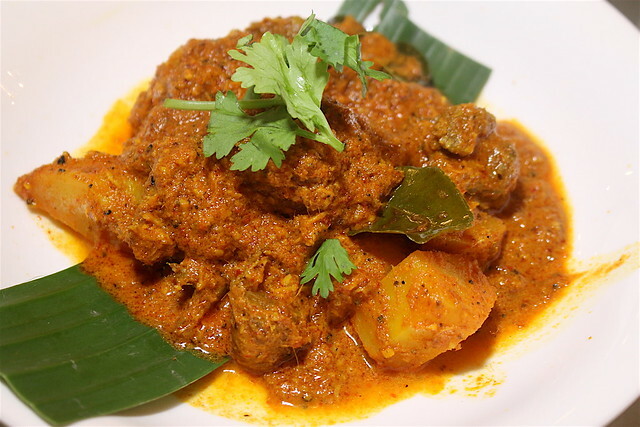 There is no powdery feel that is common in many other curry fish head. It has an interesting balanced acidity with a nice thickness. 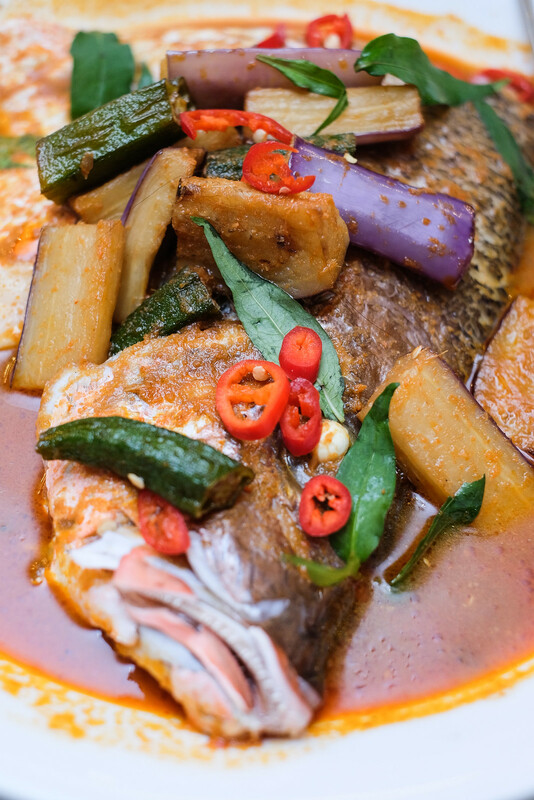 The Assam Fish Head had enough kick to feel a slight sting on the tongue, but still able to eat it without perspiring. If you cannot decide what to have for dessert, go for the Chef Dessert Platter ($15) and you can have a little bit of everything. 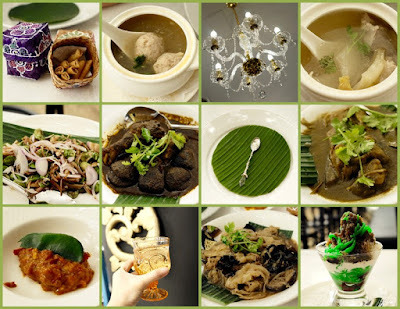 Chef selects from a range of desserts available, including Chendol Melaka ($6.50), Pulot Enti Kelapa ($3.50), Pulot Hitam Mata Kuching ($3.50), Bubur Kacang Hijau ($3.50) etc. The BB Kueh Tart ($1 each, $25 gift pack) is their homemade pineapple tart made in house. 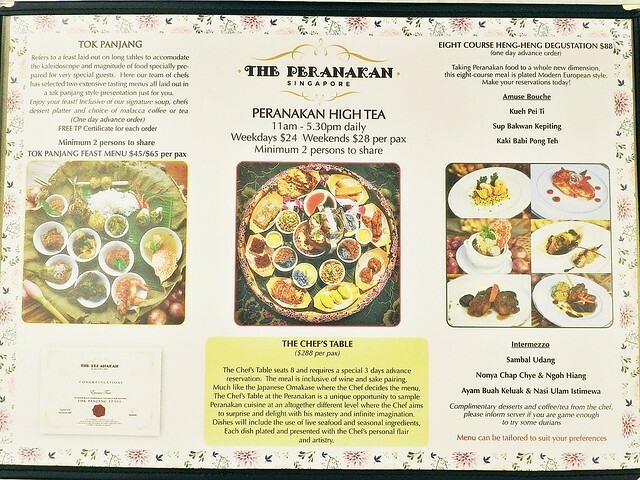 If you’re feeling a little fancy, go for the Tok Panjang ($45 or $65) – a Peranakan feast served during special occasions OR the 6-course degustation menu ($85). The restaurant recently launched their Peranakan High Tea from 11am to 5.30pm daily. 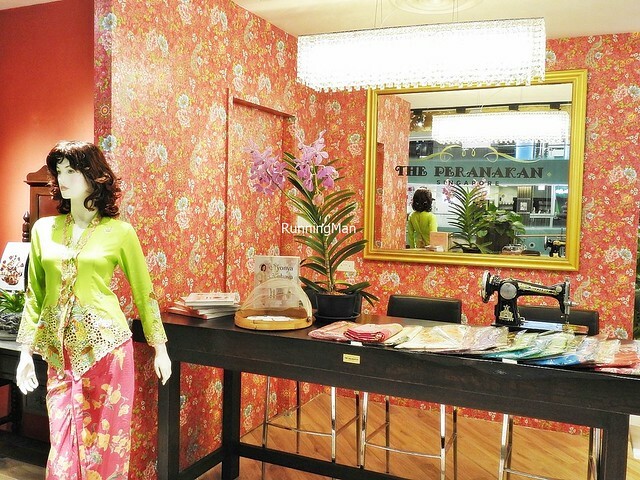 The Peranakan is simply wild. 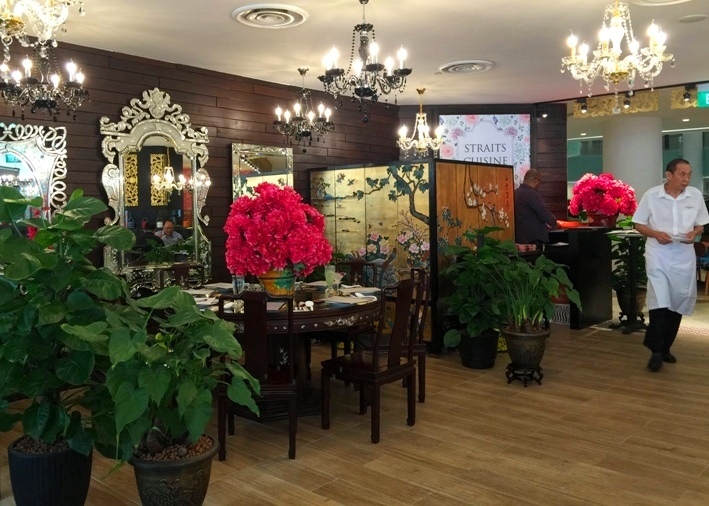 If you think you are going to see another vintage dark wood bureau, or kebaya clad mannequin in this Peranakan restaurant, you’ll be happily wrong — as I was. 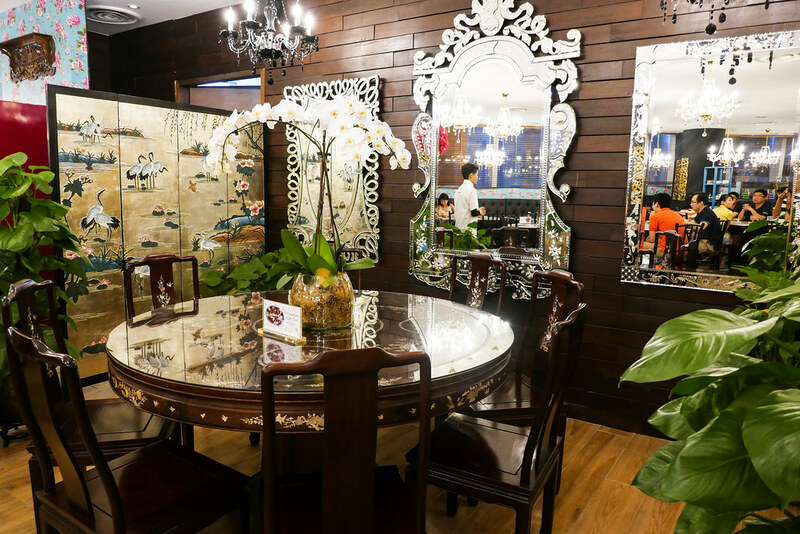 Located on the second floor of Claymore Connect in Orchard Road, this new restaurant, simply called The Peranakan — is a gorgeous collision of extravagant French boudoir and colourful Nonya aesthetics. It sounds insane, but it works. There’s always something to look at, and you just don’t want to blink in case you miss something. 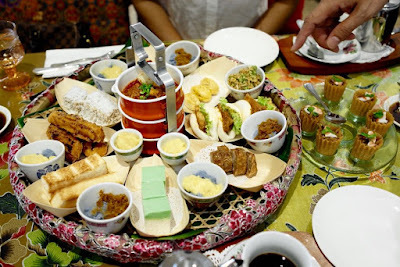 We love the elaborate water glasses that remind us of the great Nonya houses of old Singapore, the humble kettle from which water is poured, the profusion of flowers (plastic – but pretty), bright Nonya ceramics tableware and tiles, and the gorgeously dainty spoons that we are provided to scoop up tiny amounts of sambal. 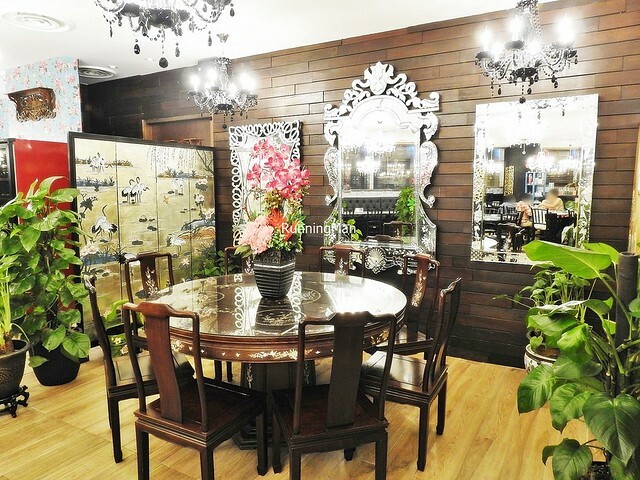 Small chandeliers hang from the ceiling, and etched, bevelled mirrors cover the walls. 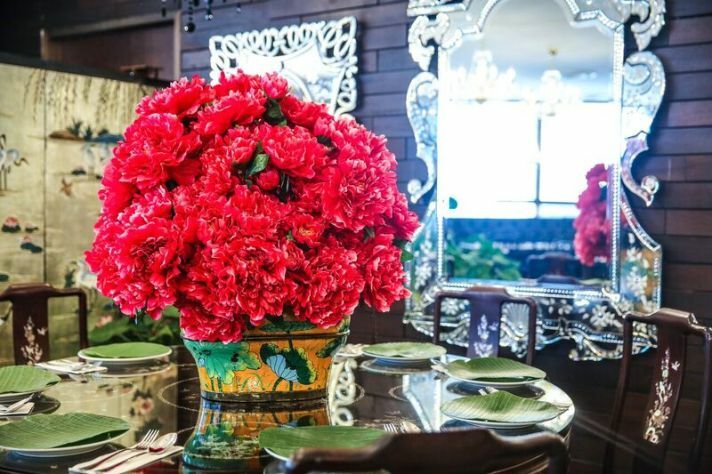 Sumptuous is the word. 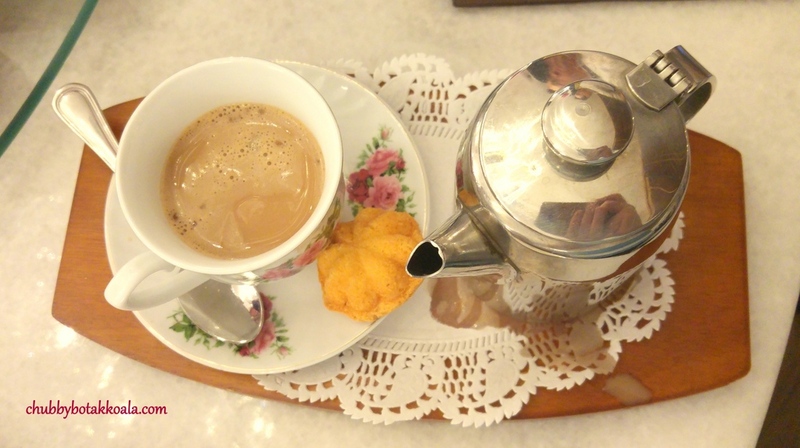 We could sip tea and eat kueh here all day. Notice the glasses and kettle on the shelves. 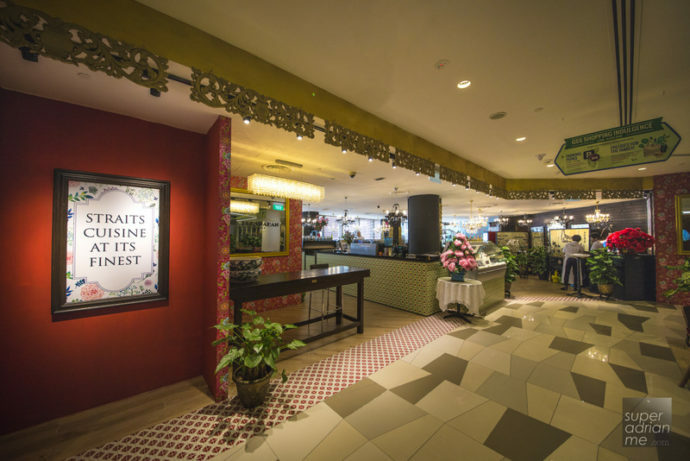 Beyond good looks, The Peranakan surprises with its fresh concepts (more later) and its combination of traditional favourites and less-known dishes. This freshness is a much needed boost to Peranakan restaurants as a genre, which have become tired with their predictable menus and stereotypical decor. 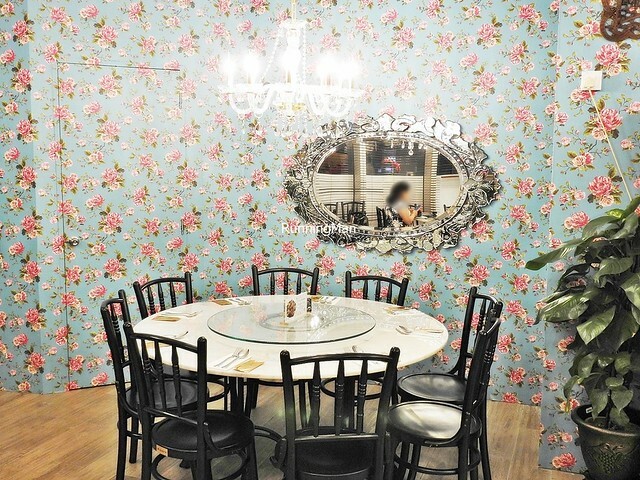 The food is generally good at The Peranakan. 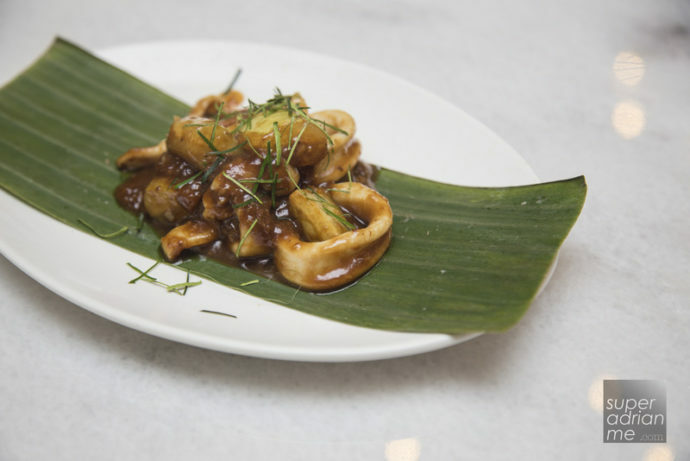 Executive Chef and owner Raymond Khoo is Straits Chinese himself, and many of his dishes are family recipes from his mother and godma. Most dishes I had that lunch was enjoyable. 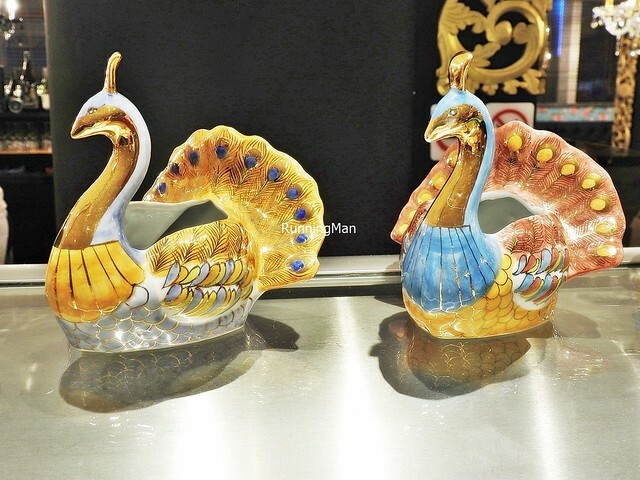 They were authentic and prices were reasonable. 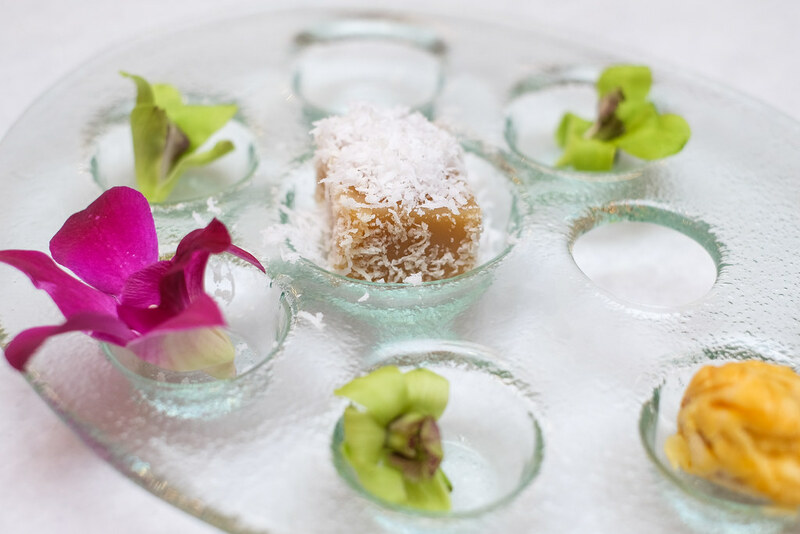 Beautifully presented jelly to refresh your palate in between courses. 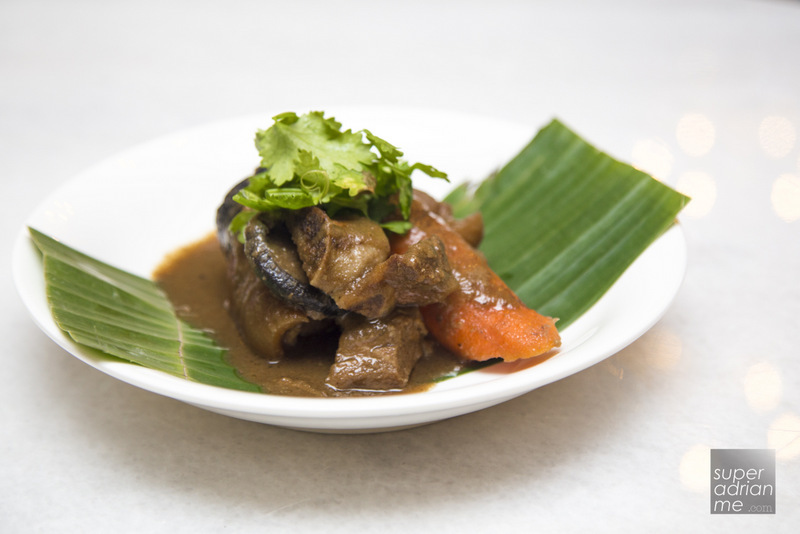 I really liked the pig trotter pongteh ($19), a stew which is usually done using chicken. 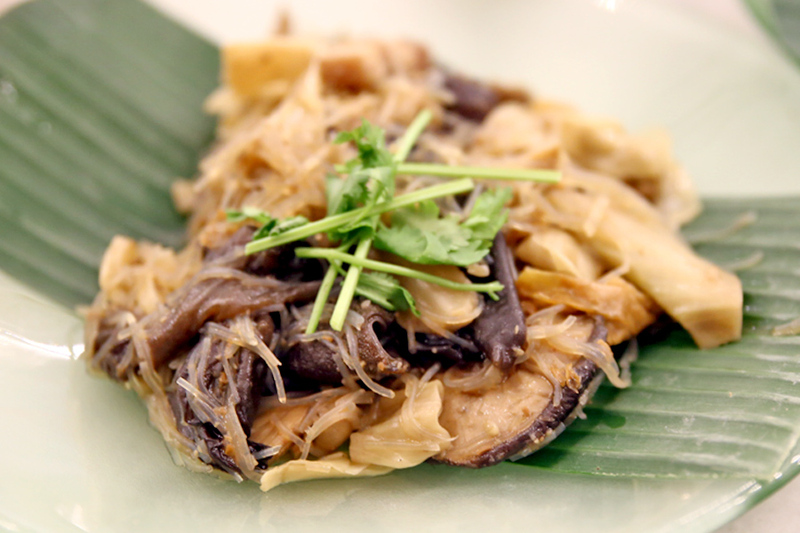 Slowly cooked in a base of soy sauce and tau cheo, the meat is rendered savoury sweet, rather tender and what made this particularly delectable was the chewy, slightly gelatinous cartilage from the trotter. 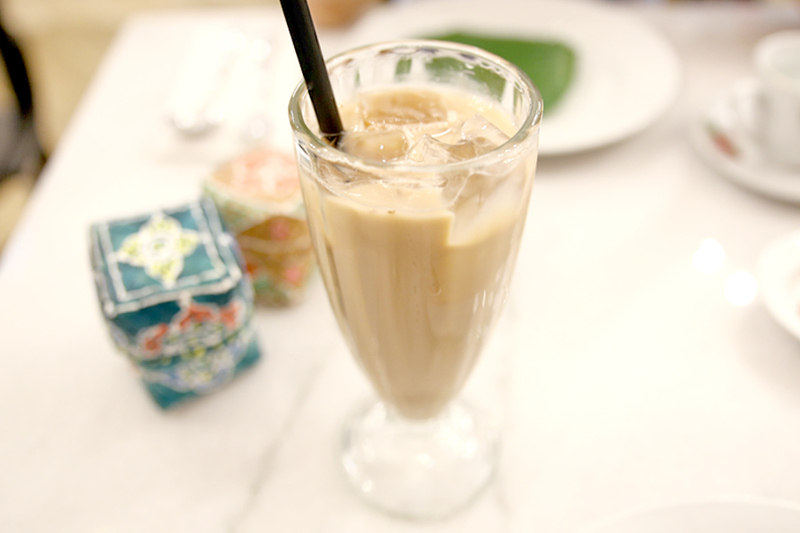 This is hardly found in Nonya restaurants and quite a treat. The nasi ulam ($15) was excellent. 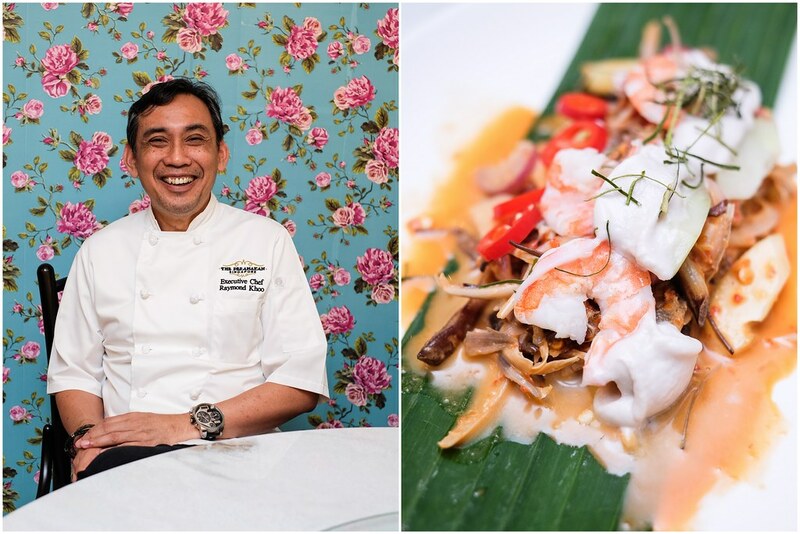 Chef Raymond adds salted fish to it — again very unusual in nasi ulam — with a little sambal ulam and heightened by aromatic herbs of lemongrass, kaffir lime leaves, and turmeric leaves. 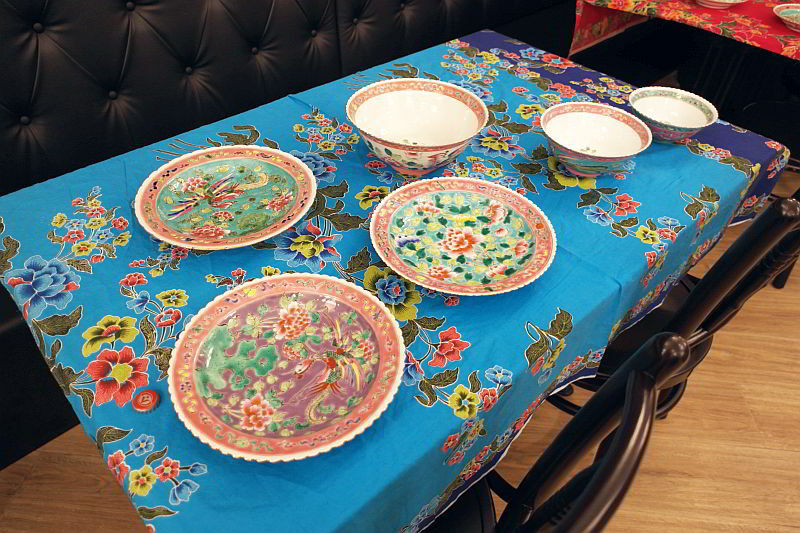 While the Malay version is completely vegetarian, the addition of salted fish, Chef tells us, is a Peranakan practice. 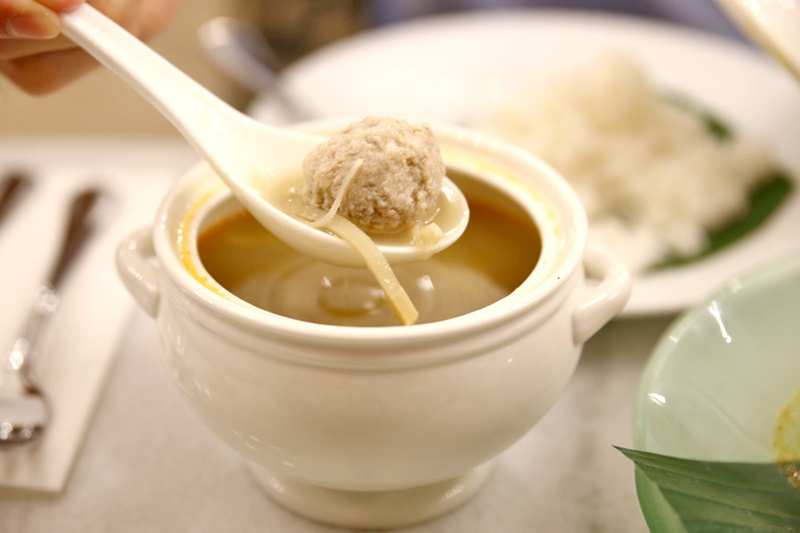 The whole combination was complex and fragrant, with rice cooked just right — fluffy and grainy. 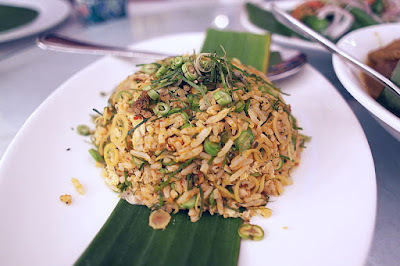 Apparently it is the only Peranakan restaurant in town that serves nasi ulam this way. 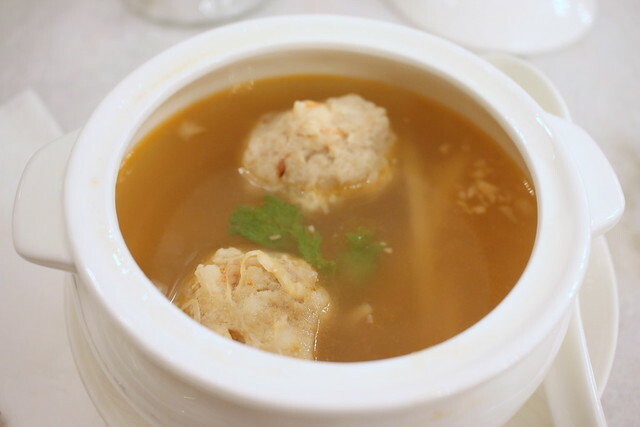 The bakwan kepiting soup ($9) was admirable; while I found the stock rather bland, the meatballs were big and generous in the amount of crab meat and bamboo shoot. They were nicely done too – tender and bouncy. But most people preferred itek tim ($7), or duck and salted vegetable soup, which had heartier flavours. But as a homecook, I opted for the soup that called for more arduous preparation and skill. 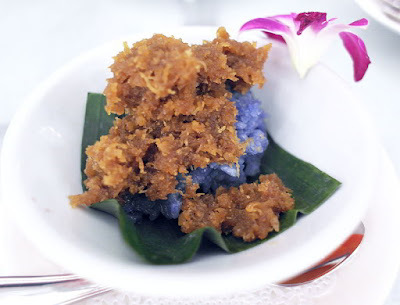 I spied deep fried bakwan kepiting on the appetiser menu and made a mental note to come back and try it. 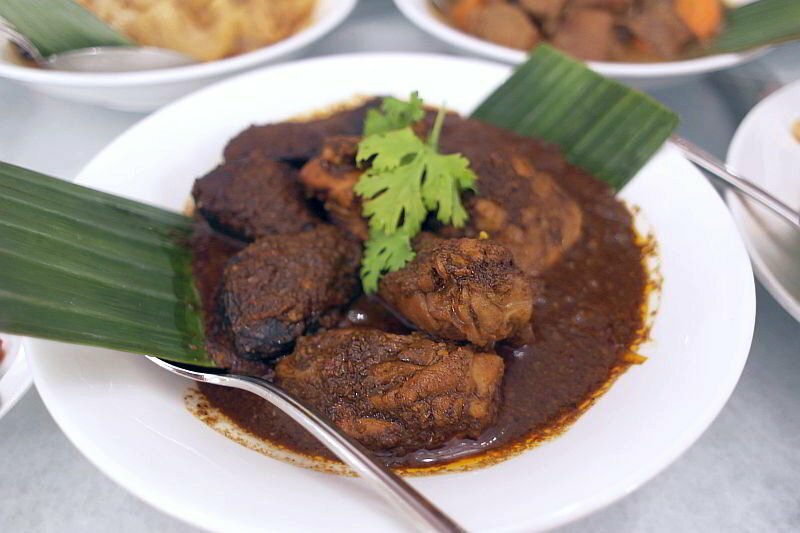 The chicken buah keluak ($19), a must-have standard at all Peranakan restaurants, was very nicely done; the black nuts were respectably large specimens nicely filled, and the chicken well cooked through with the flavour of the stew. The sambal udang gala ($27), huge prawns cooked in rich, savoury sweet sambal sauce would have been excellent too, but parts of it were very much undercooked and I had to put it aside. 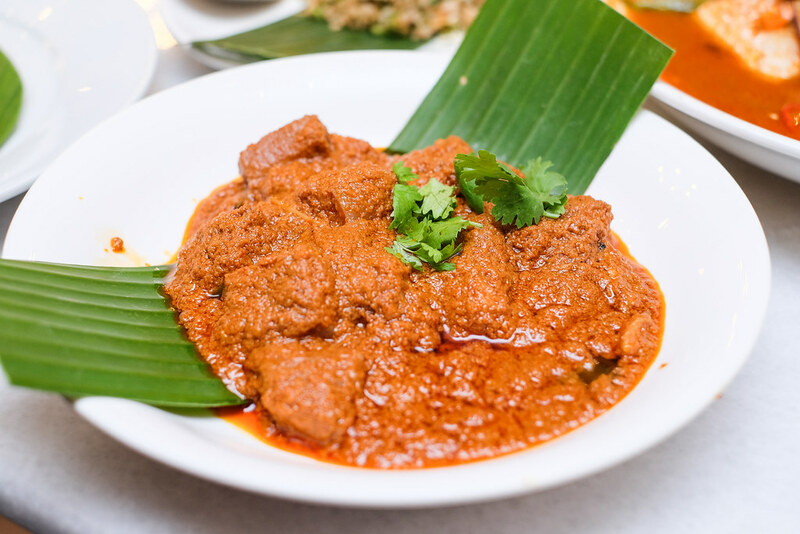 Look out for the sum chun satay ($19), pork belly fried in a special spiced rempah – fragrant, savoury, light and altogether delicious. 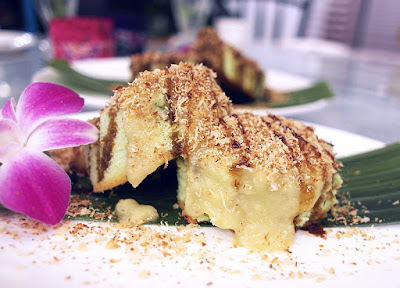 It was served on a plate rather than skewered and is yet another little-seen dish that’s a must-try here. 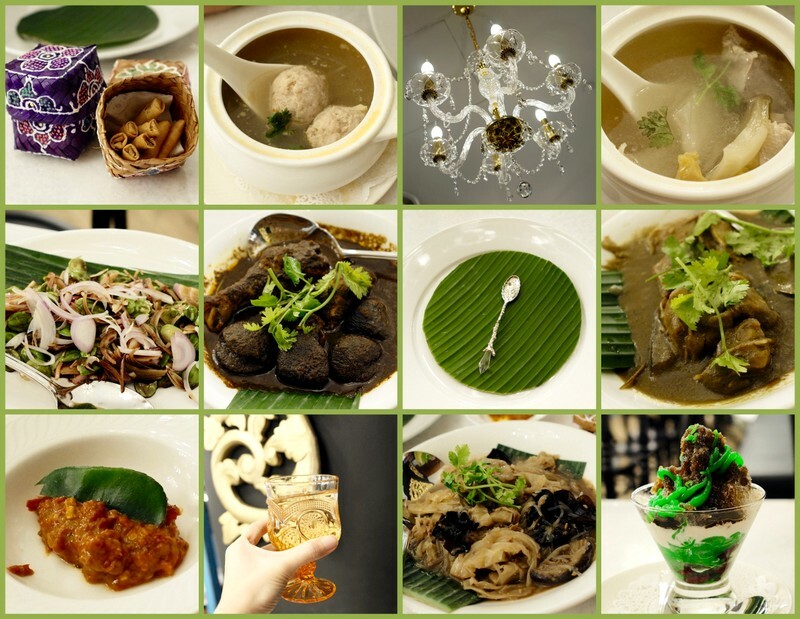 While I enjoyed most of the dishes at The Peranakan, a few missed the mark, I feel. 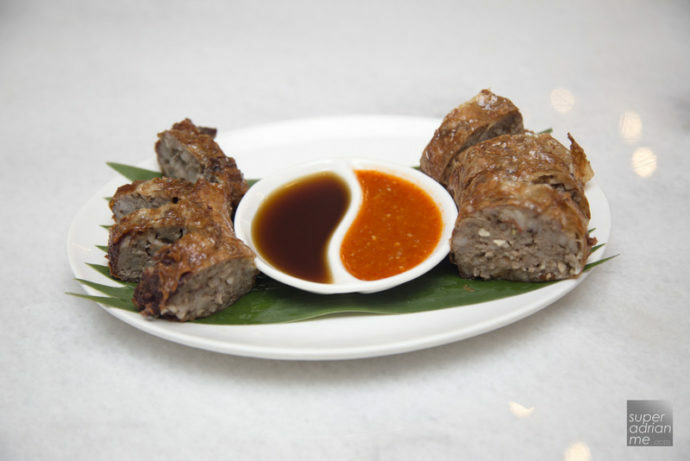 The liver ngoh hiang ($15) was a victim of its own generosity — it was a large roll of meaty filling, which had too much meat in relation to its beancurd skin; the balance was not quite there. I didn’t taste much liver in there, either. The kueh pie tee was not crisp, the filling a little scant and the strips of bangkwang did not live up to the Peranakan’s reputation for fine knife work, and the chap chye was not as flavourful as it could have been and the vegetables came in great pieces. 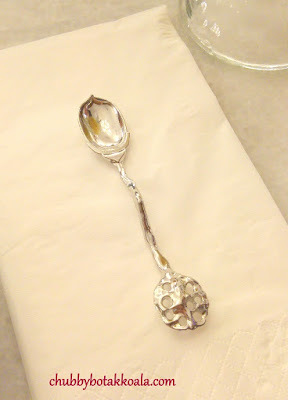 Slicing them smaller would have made a bit more elegant eating, I would imagine. 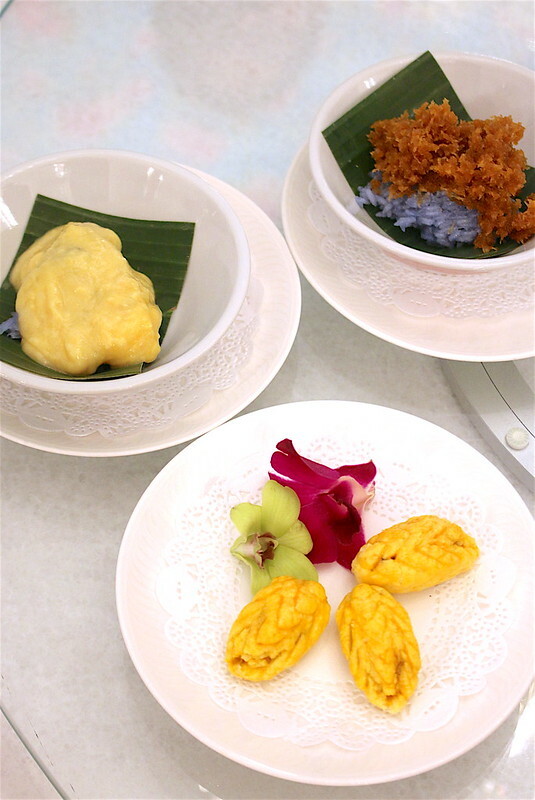 I didn’t manage to try the desserts; but they looked promising – bubor cha cha with durian ($5), pulot enti with durian (glutinous rice with durian paste -$5), bubor hitam with mata kuching, coconut ($3.50) and durian ($5). 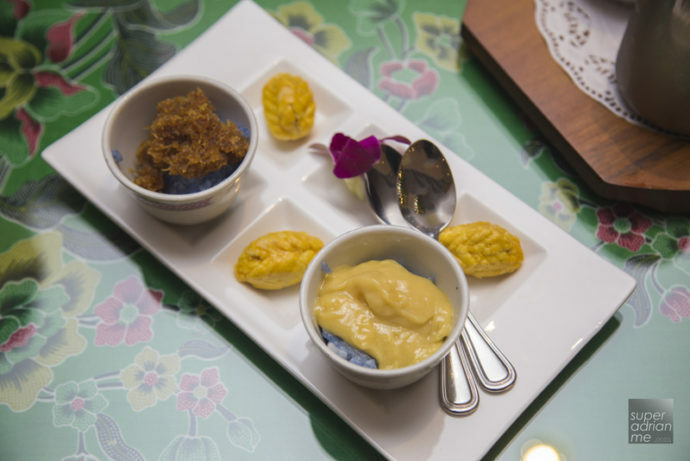 Clearly the chef loves using durian for his sweets. 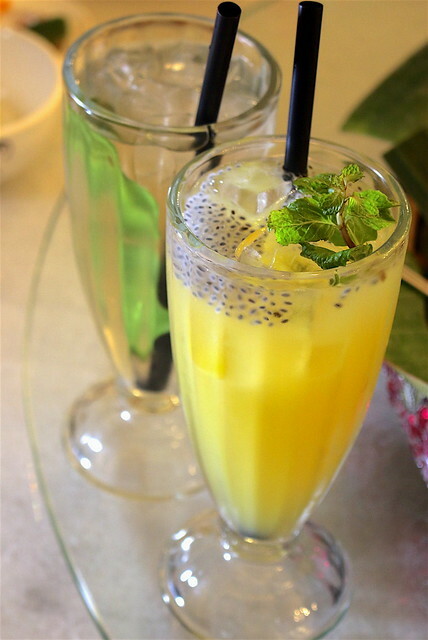 For drinks, have the kumquat with biji selasih which was particularly refreshing. 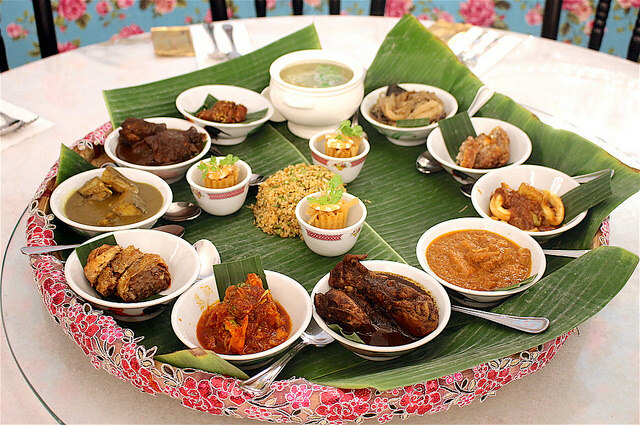 The restaurant offers a number of fresh concepts too – like the tok panjang, a lavish communal menu of multiple dishes served on rattan baskets around a mound of ulam rice. 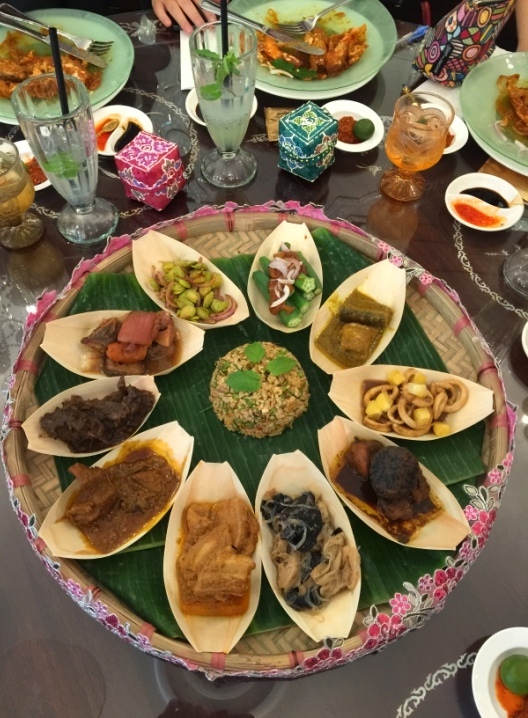 The tok panjang at this restaurant plays on the Peranakan festive feast traditionally laid out on a long table like a buffet. While this presentation is not going to win over many purists, it is a good meal to invite a foreign friend to. Diners also go home with a certificate for having had this experience. 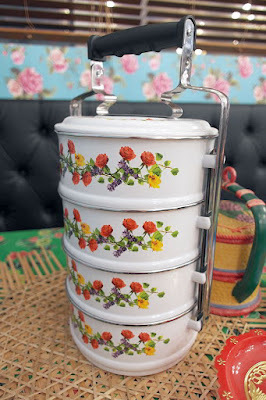 A little kitschy, but cute. Pick from a $45 or a $65 menu. Then there’s what Chef Raymond calls the Chef’s Table, like an omakase, where he decides the menu (from $165, 7 days advance reservation required) and comes with wine pairing. 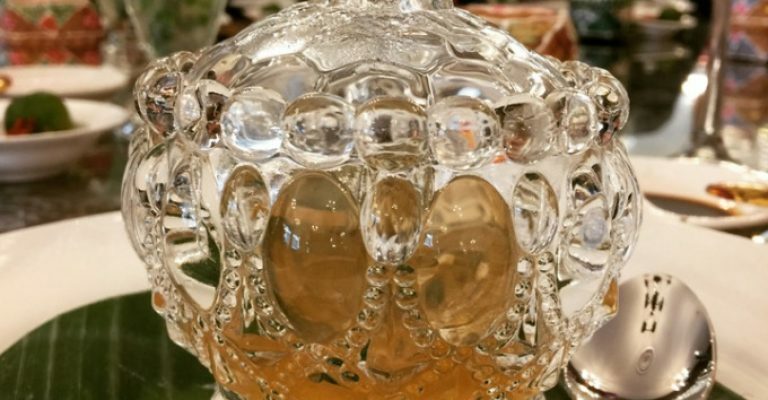 On the other hand, the 6-course degustation ($85 per person) is individually plated and best suited for a more formal style of dining. 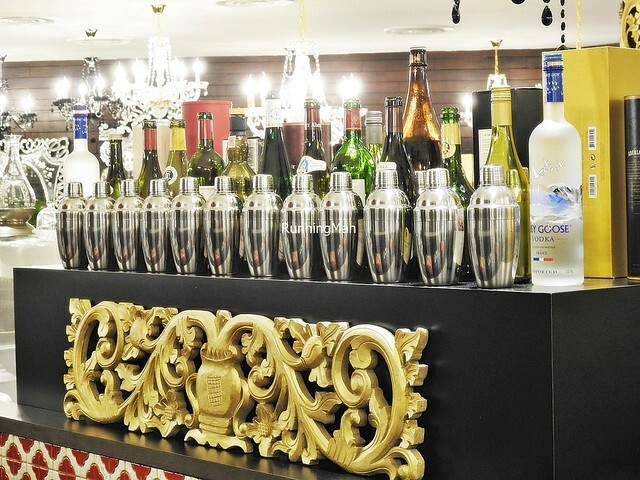 This is for a minimum of 6 people, and one day’s advance reservation is needed. 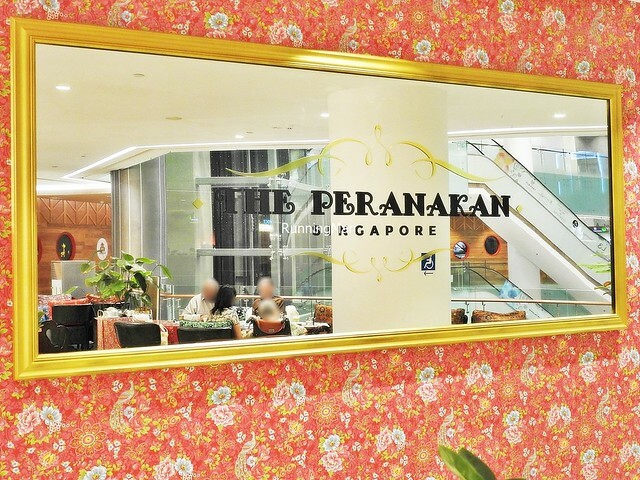 Finally, the excellent service staff here made the experience at The Peranakan heartwarming. 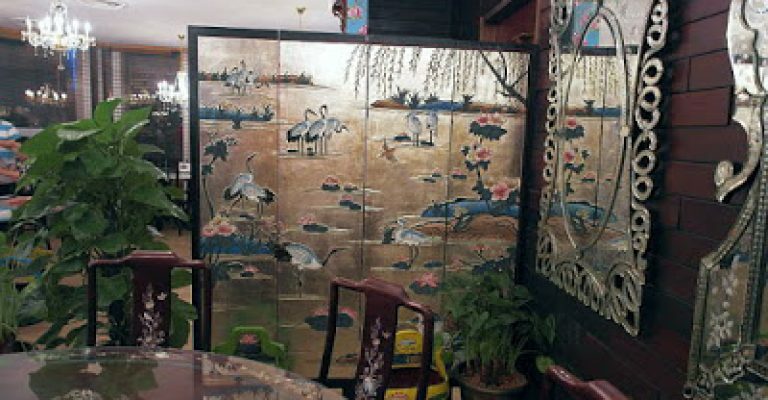 The staff here, who had worked with Chef Raymond before, are mainly of an older vintage. They are warm, sincere, gentle and gracious — almost parental in their demeanour. 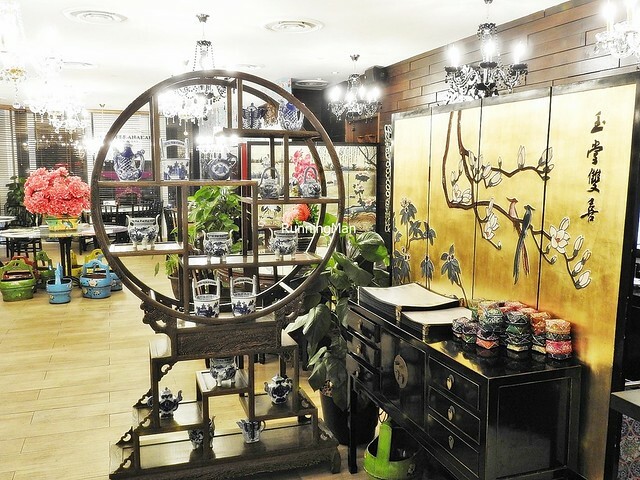 They exude an old world charm and you feel very well taken care of. 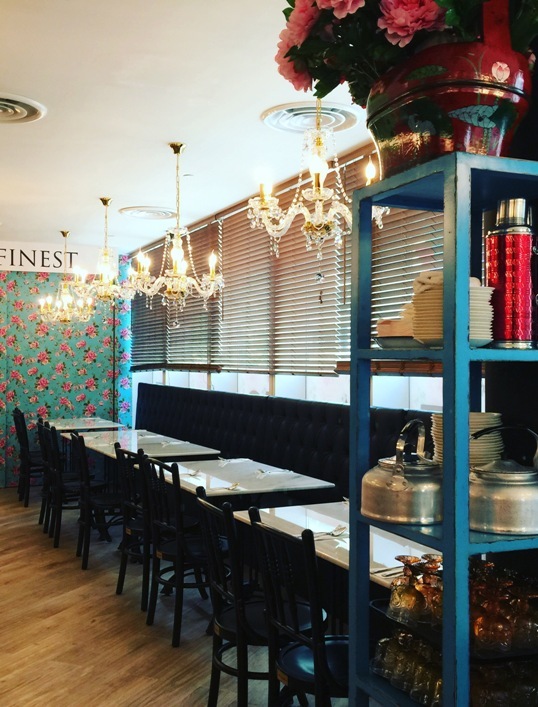 They make a big difference to this restaurant and makes it stand out. 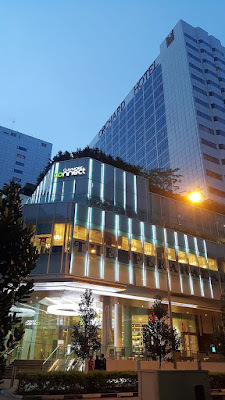 It’s definitely a place I would go back to. Ornate. 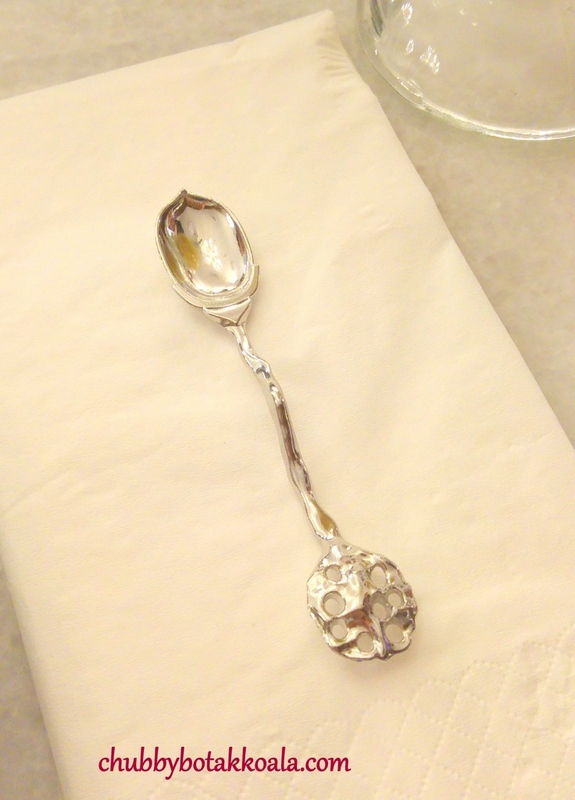 Opulent. Colourful. 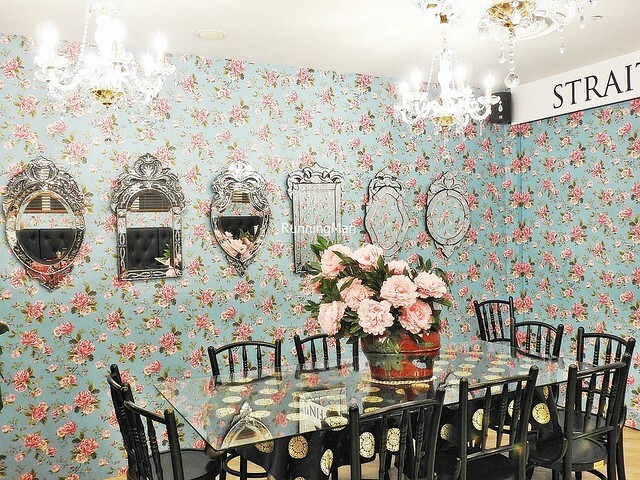 Somewhat over-the-top. 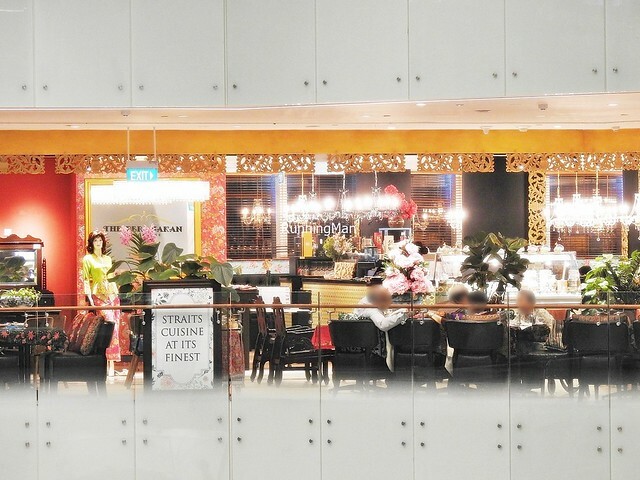 These are the reaction from guests at the new The Peranakan restaurant serving fine Straits Chinese cuisine. 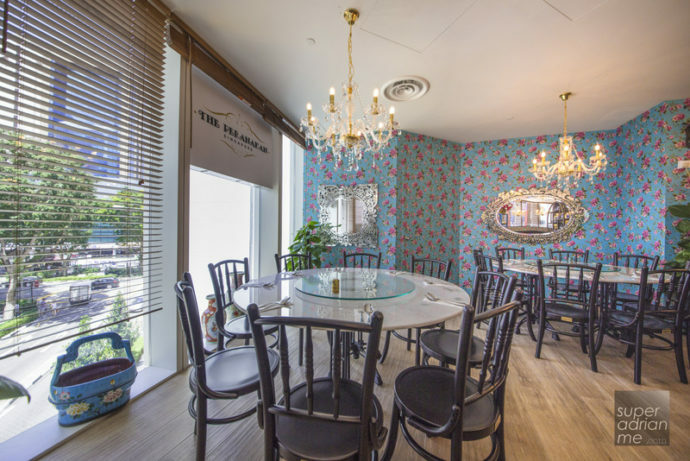 Its decor is truly bright and loud, but befitting as our numb senses (from the many new restaurant openings) require that visual spectacle to catch our attention. 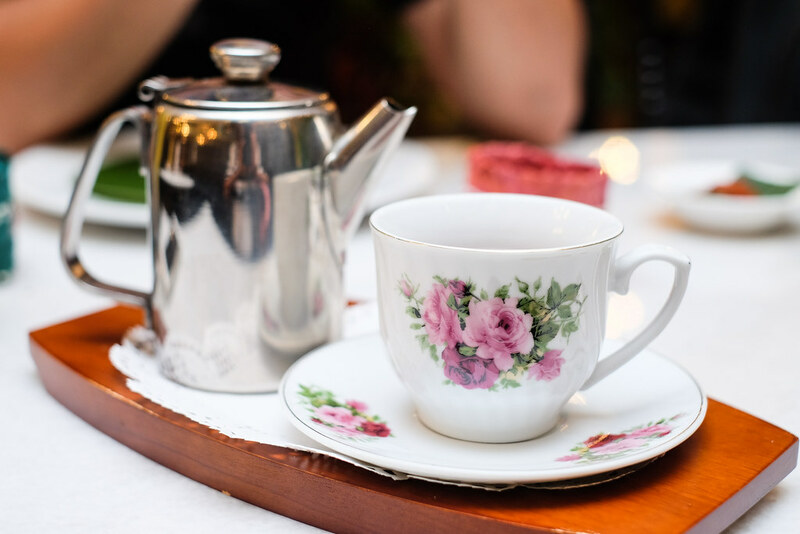 For me, it was akin to Alice in Wonderland – a playground for the senses! 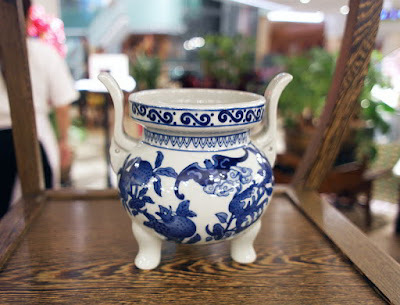 Peranakan Chinese or Baba-Nyonyas are known to be fiercely and aggressively protective of their recipes. And these vary from family to family and also depends on a family’s financial or social standing. But essentially, their recipes are almost considered a heritage, a legacy even, that is hopefully passed on to the next generation. 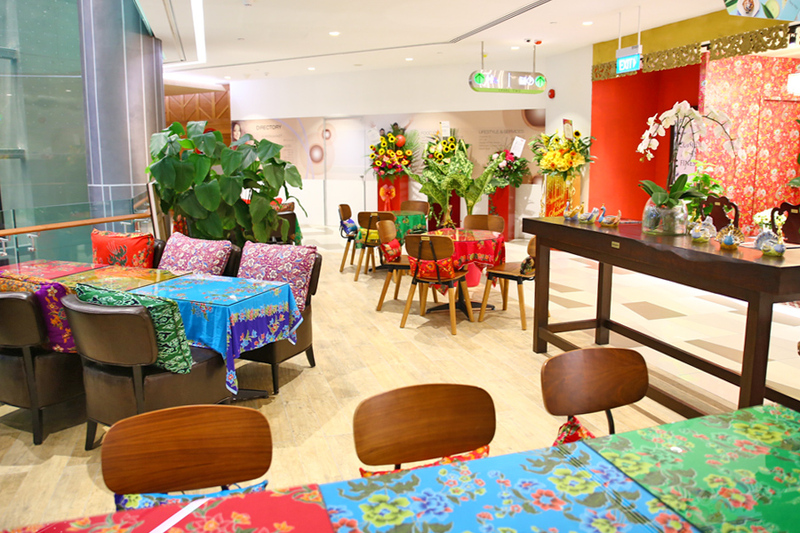 The Peranakan’s executive chef Raymond Khoo is one such Peranakan son who is making his family proud. 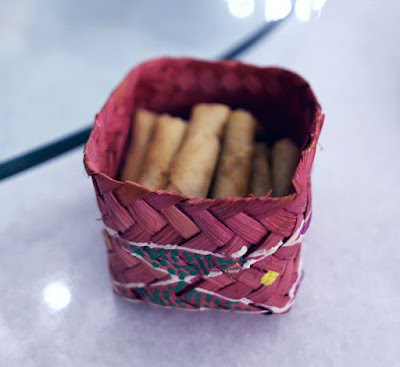 “Cooking is in my DNA and in my family, it is not limited only to the women although my Great Grandma, Grandmother, Mum, Aunts and my Godmother have all played a significant role in shaping my preferences and sharpening my palette. 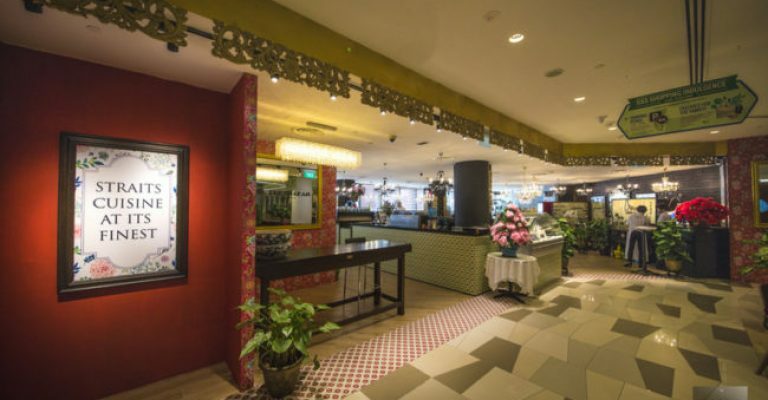 My interest has always been in elevating F&B concepts to a different level and it has always been a personal dream to open a Peranakan restaurant combining the recipes of my Mum and Godma.” says Chef Raymond. 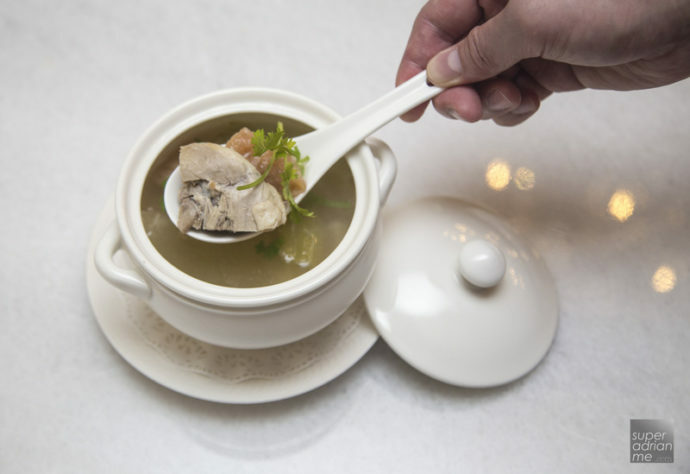 The authentic Itek Tim duck soup (S$7 a bowl) is boiled with salty vegetable and sour plum. 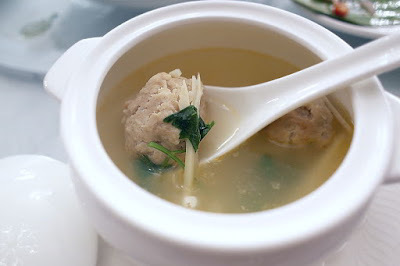 This soup definitely helps to “kai wei” (开胃) or “open up your appetite”. 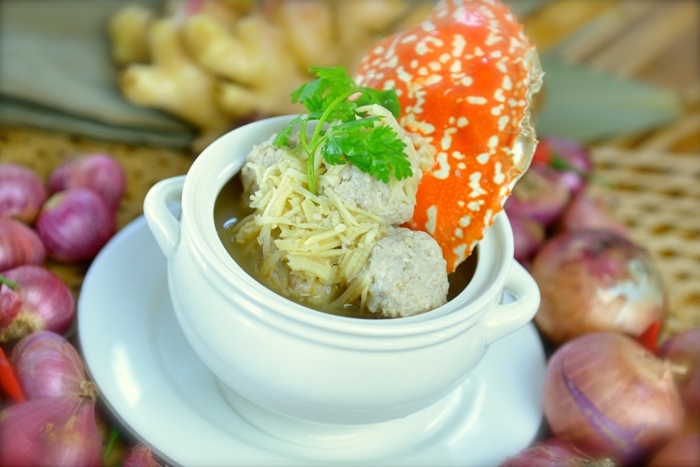 Another all-time favourite is the Bakwan Kepiting (S$9 a bowl) which is a traditional pork ball soup in rich broth with bamboo shoots. 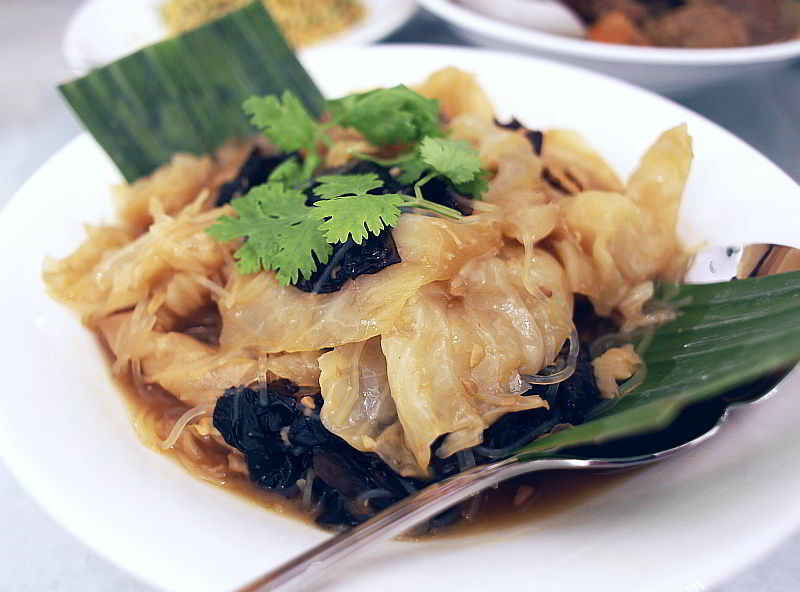 The light and refreshing Sayur Sayuran (S$12) consists of steamed lady’s fingers and brinjal served with shallots and topped with Chinchalok – fermented shrimp sauce. 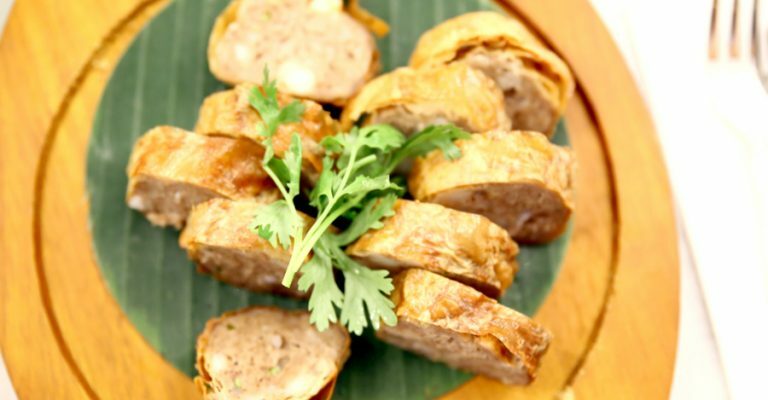 The hand-made Ngoh Hiang (S$15) comes with a choice of prawn or pork liver filling. 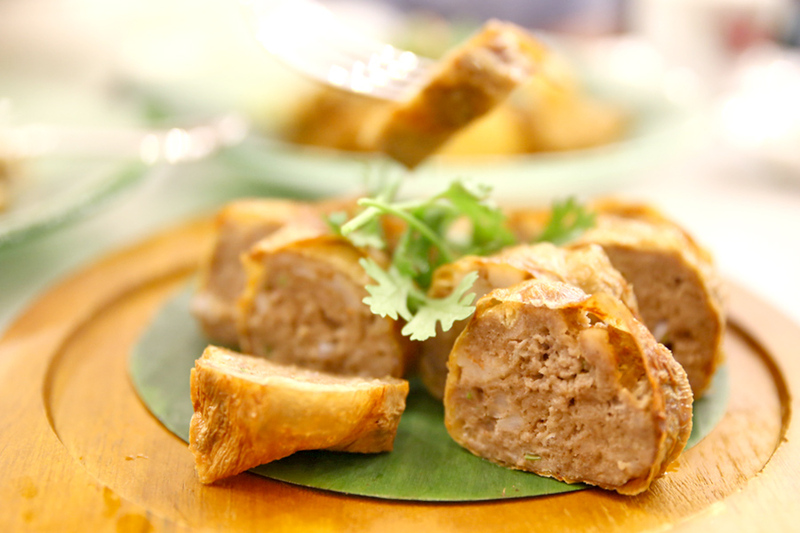 This appetiser is primarily minced pork and chopped chestnuts flavoured with five spice and wrapped in a crispy beancurd skin. 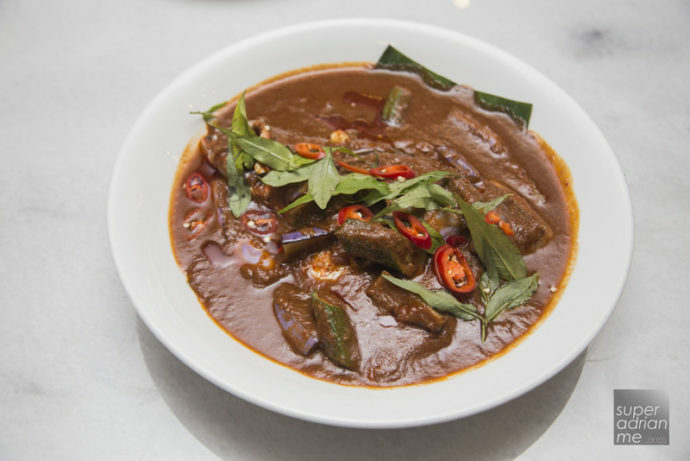 The mouth-watering chilli that comes with this Ngoh Hiang is a vinegar-based chilli sauce called Chilli Cuka and it goes perfectly with this dish, especially if you choose the richer pork liver filling. Sambal Sotong (S$17) is fried with tamarind and starfruit. 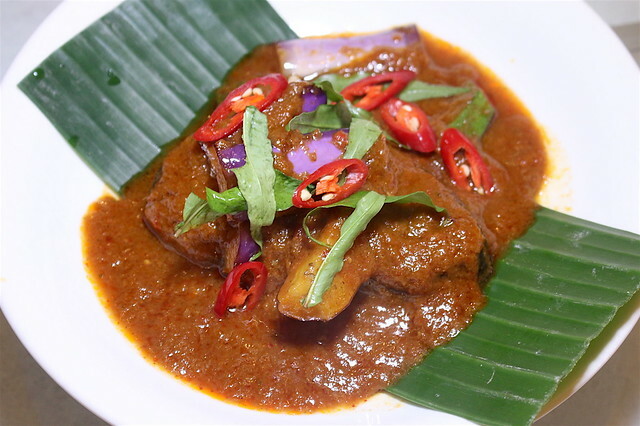 The starfruit is an interesting ingredient as it helps to balance the spiciness and adds a uniquely juicy bite. 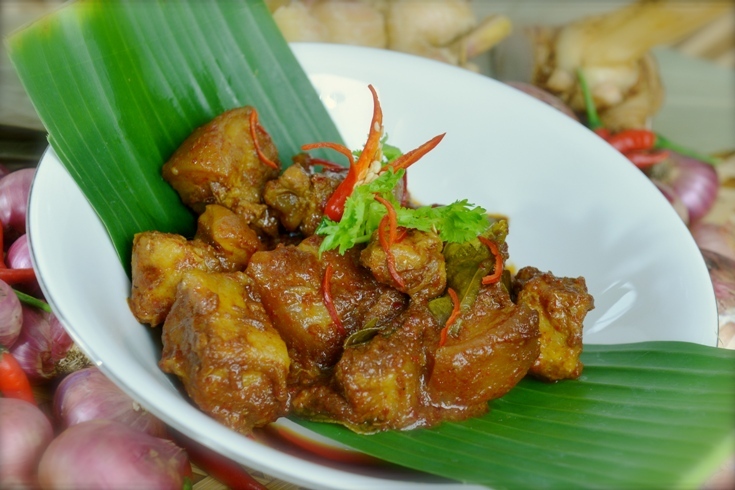 Ayam Buak Keluak (S$19) is a dish you either love or hate, but is synonymous with Peranakan cuisine. Buak Keluak are nuts from a tall mangrove tree called Pangium edule. They are poisonous but are made edible through fermentation. 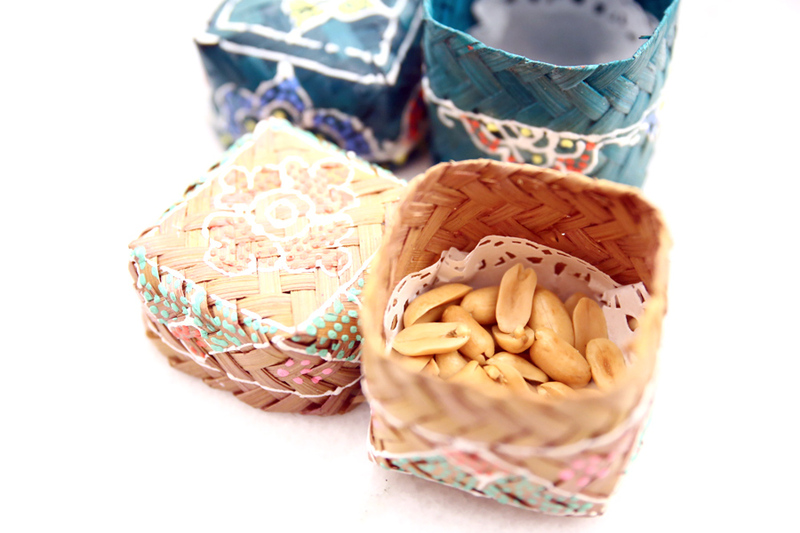 The nut’s flesh is dug out of its shell, cooked and stuffed back into the shell. At The Peranakan, the stuffing is 100% pure Buak Keluak and not mixed with other stuffing like meat. Moreover, each nut in this dish contains two nuts’ worth of pure flesh! 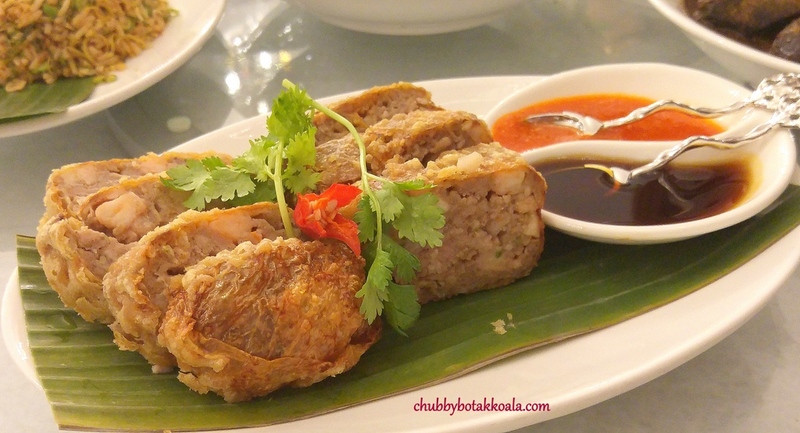 The Kaki Babi Pong Teh (S$19) uses pig trotters instead of the typical pork belly. 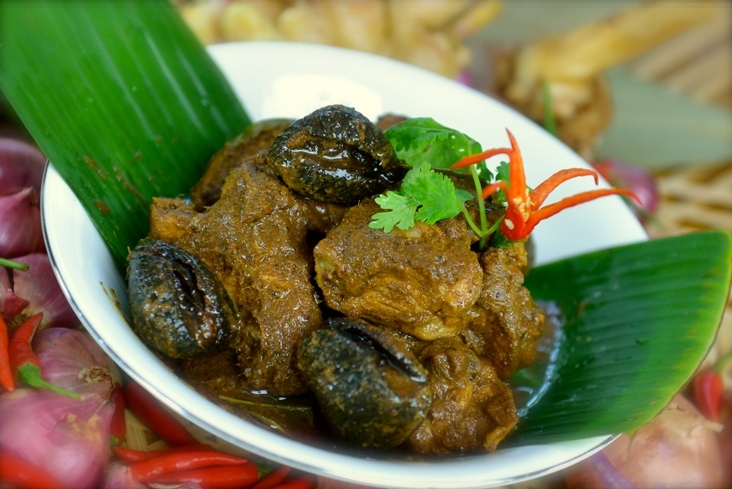 This Malaccan style dish is cooked for six hours giving it a rich and flavourful taste plus extra tender meat that falls off the bone. 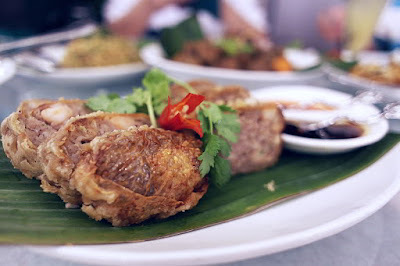 The Assam Pedas Fish Head (S$27) is spicy, sour and savoury. 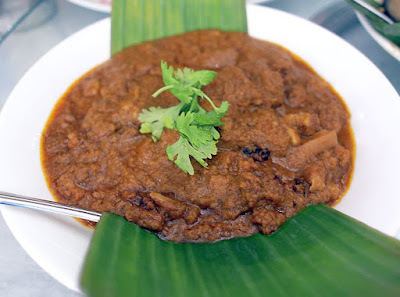 The aromatic chilli tamarind gravy goes well with white rice. Talking about rice, the Nasi Ulam (S$15) is a must-try. 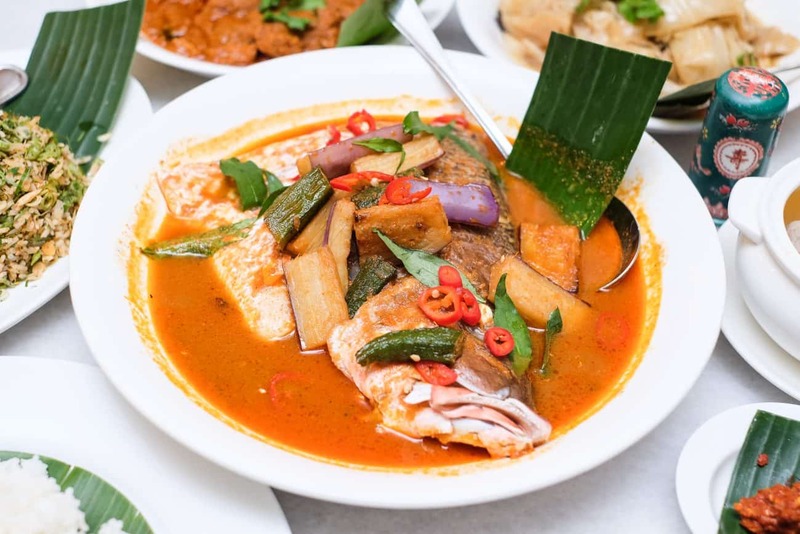 Cold white rice is mixed and tossed with ingredients like lemongrass, kaffir lime leaves, turmeric leaves, sliced long beans, baked fish, minced salted fish plus the perfect amount of sambal belachan. Warning – this is highly addictive. 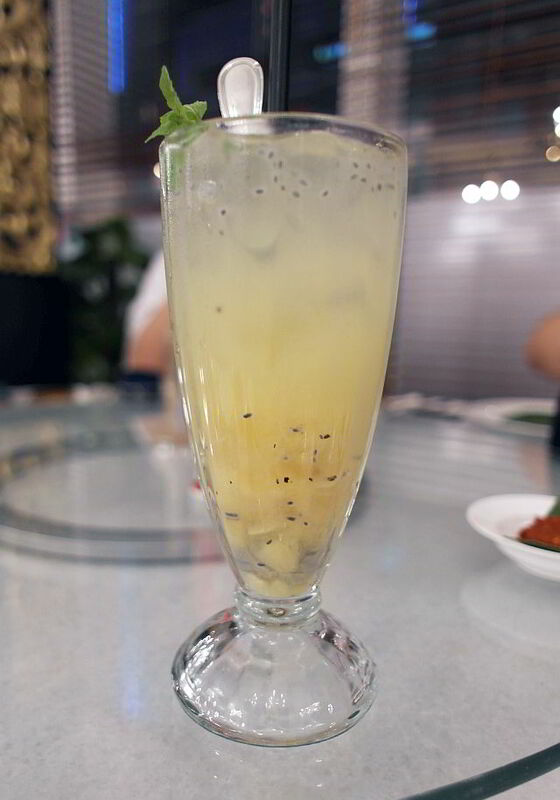 The first mouthful might feel a little odd if you are not used to eating cold rice and raw herbs. 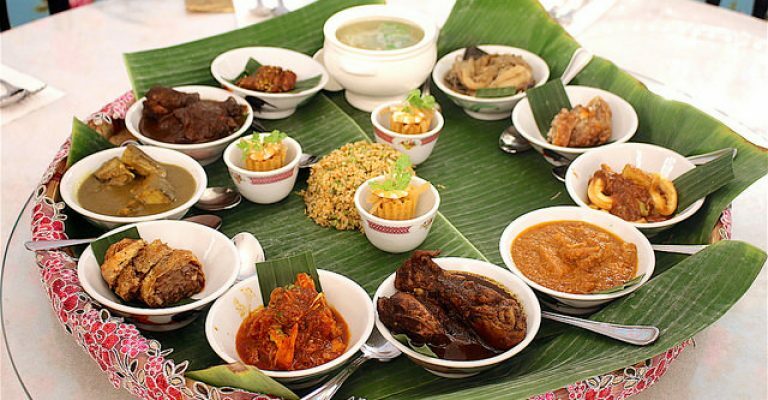 But as you chew, the flavours become more and more intense and you will “unconsciously” keep going until you finish the whole plate. 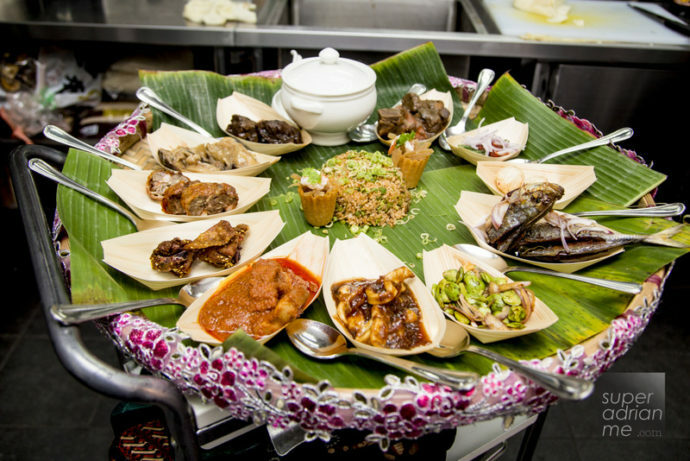 If you want a degustation of sorts, get a few friends and order the Tok Panjang Feast (S$45 or S$65 per person) to share. 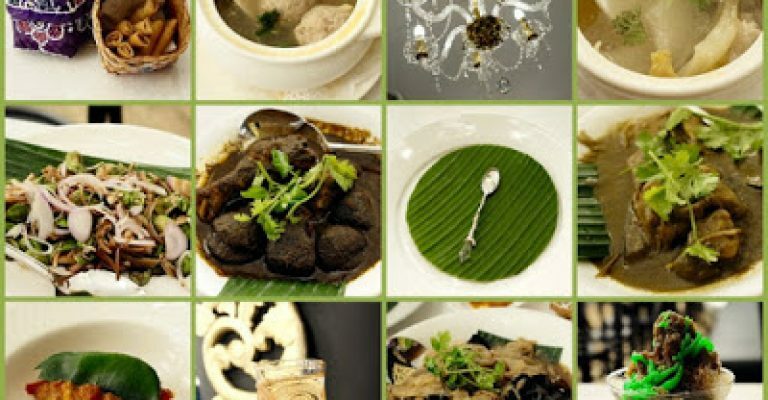 It consists of an array of different dishes so your taste buds get a blast. Orders are in sets of two. So if you are a group of six, you order three sets. 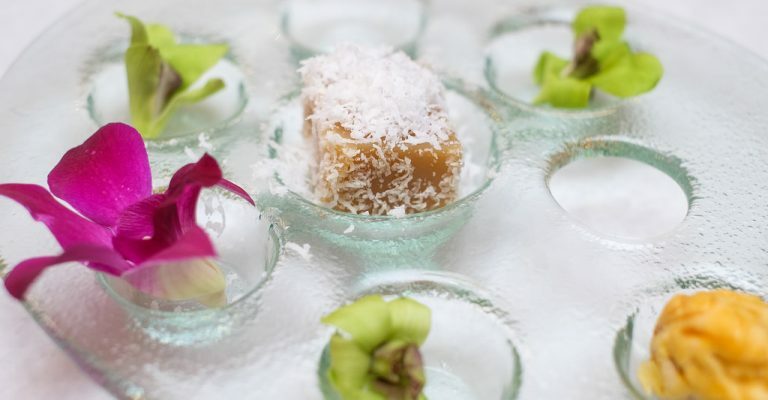 As always, leave space for dessert. 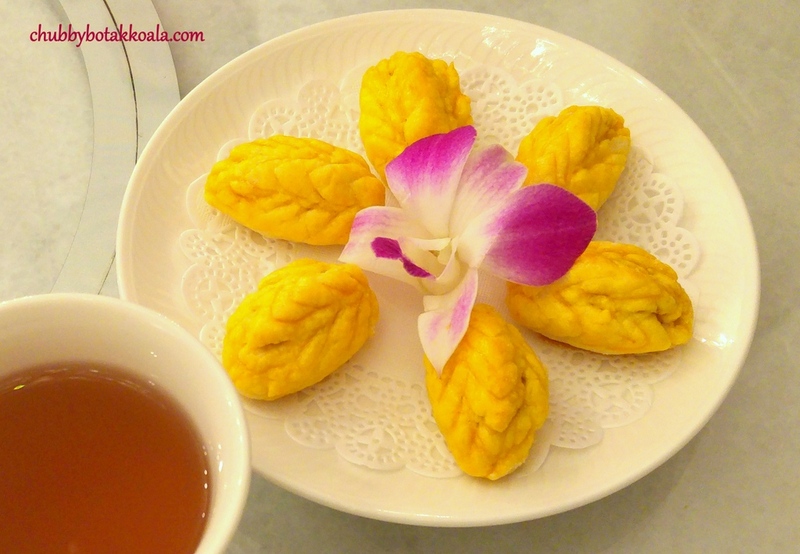 The Pulot Enti Durian (S$5) which is glutinous rice with durian paste, will pleasure durian lovers. 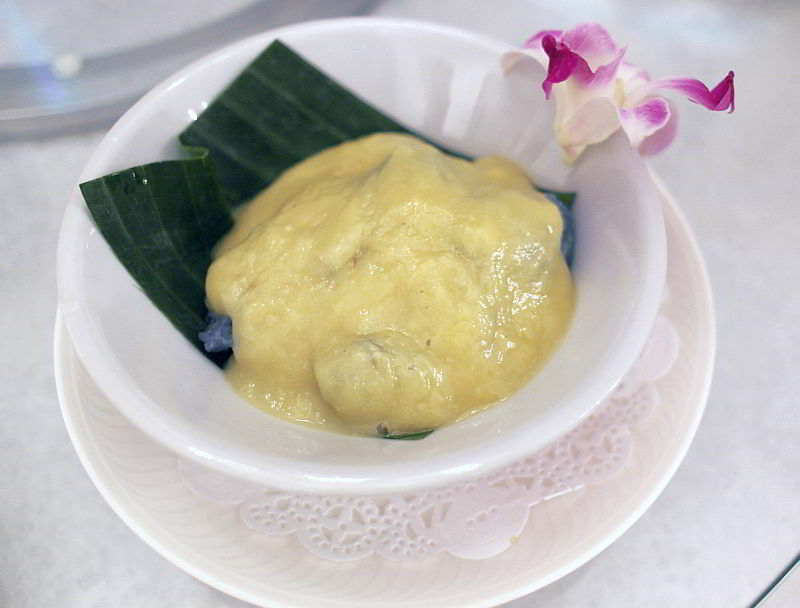 The smooth durian paste made from Malaysian durians is sweet with a tinge of bitterness. 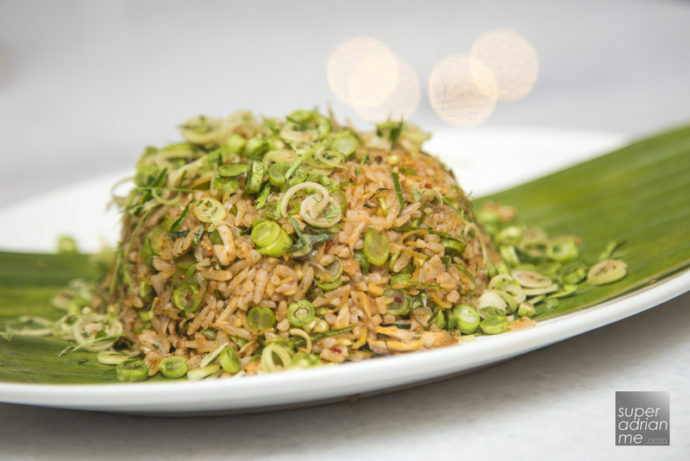 The Pulot Enti Kelapa (S$3.50) – glutinous rice with gula melaka coconut, is superb too. 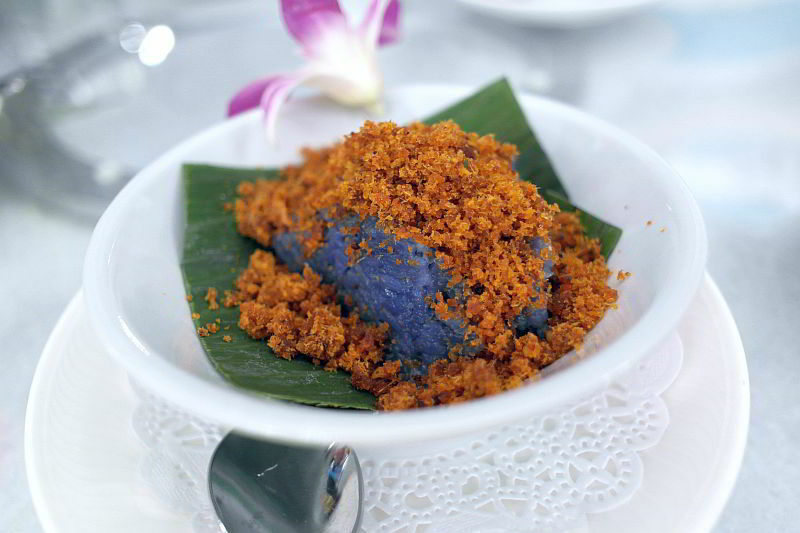 It is like eating “kueh kueh” with a spoon, without the sticky feeling on your fingers. I had two portions of each! 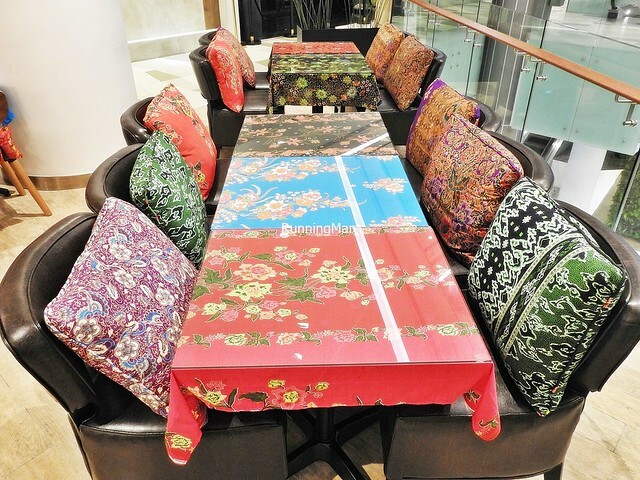 The Peranakan is located at #02-01, Claymore Connect@ Orchard Hotel, Singapore 238879 and opens daily from 11am to 10pm. Call +65 6262 4428 for reservations.